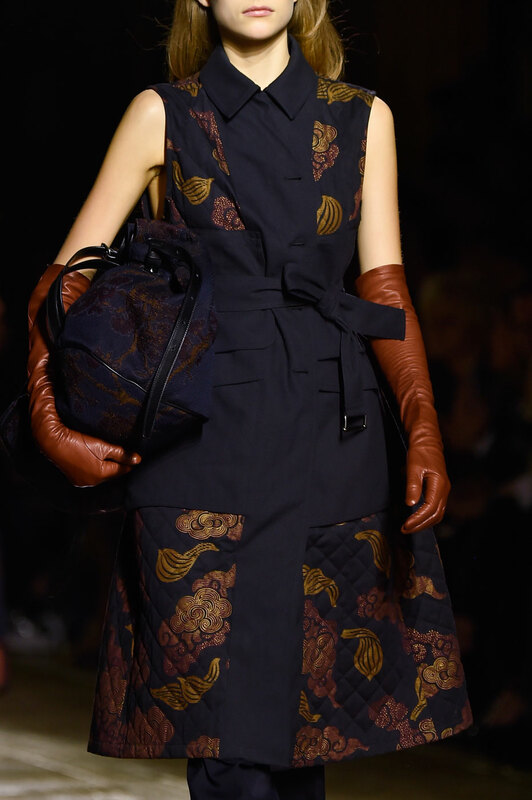 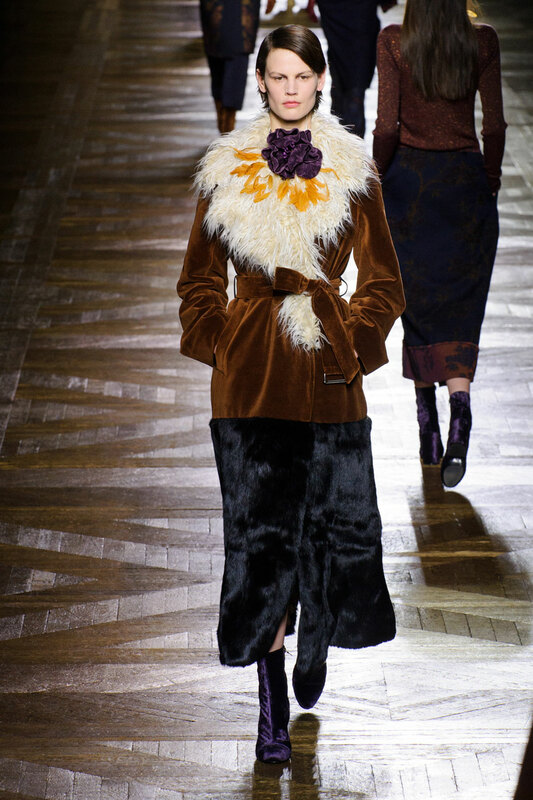 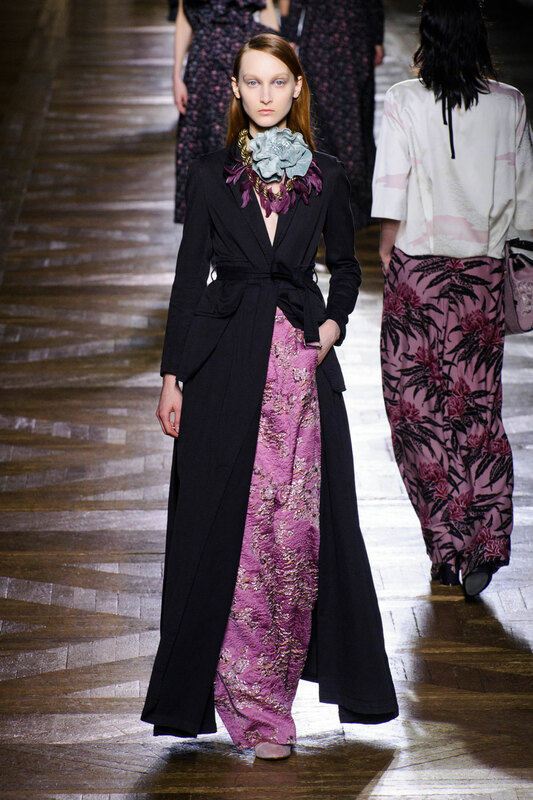 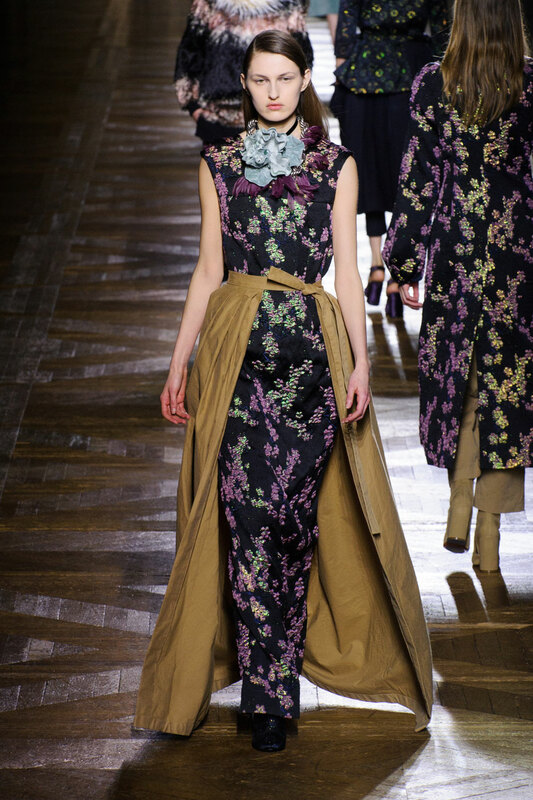 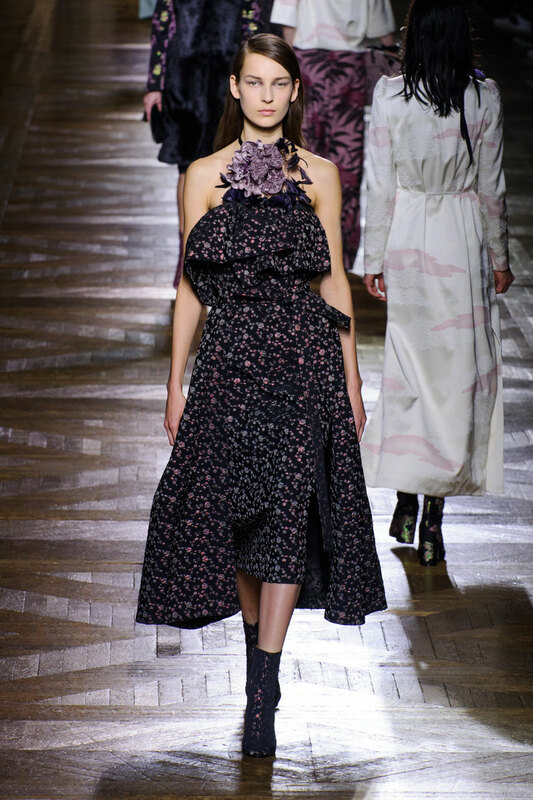 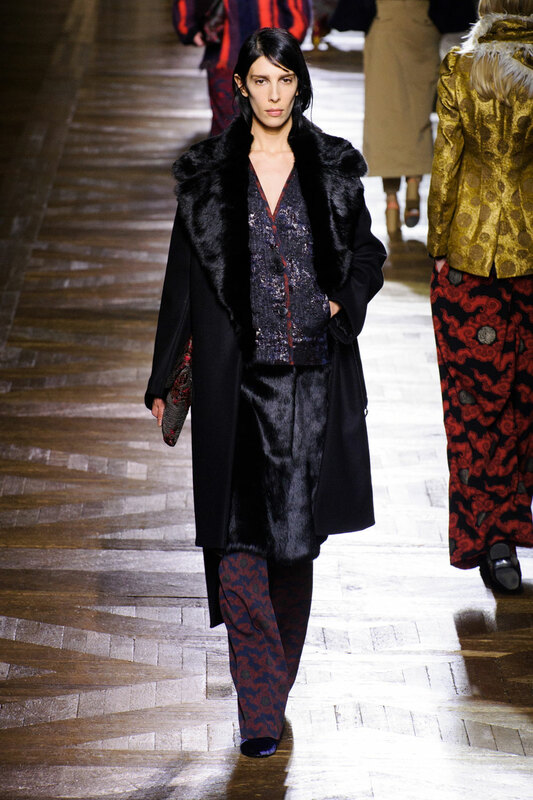 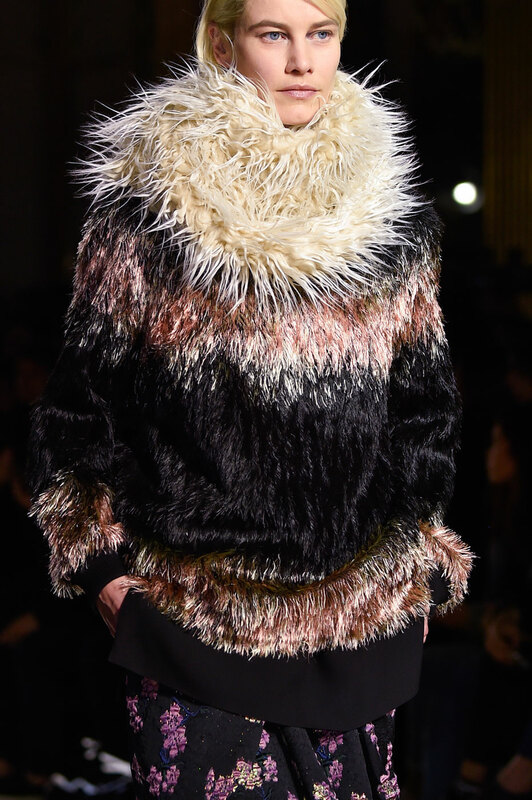 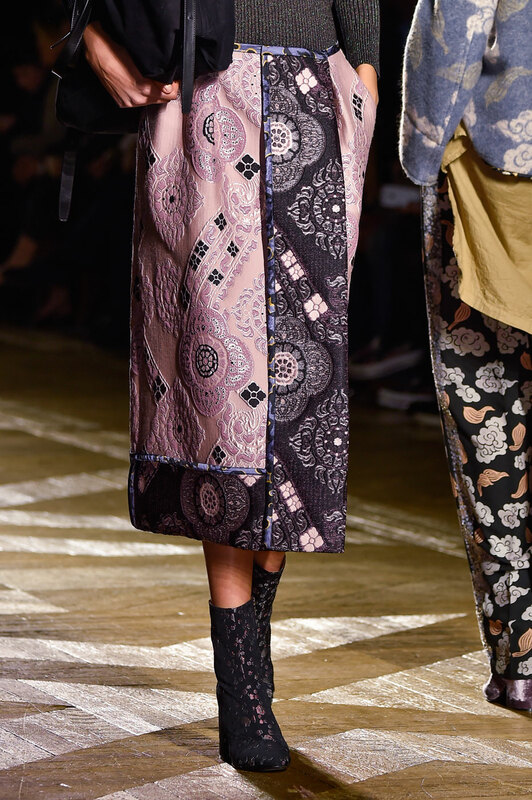 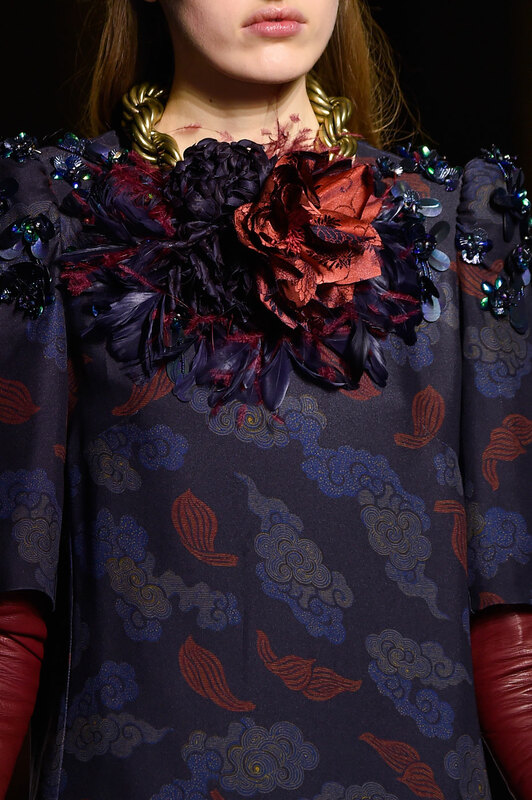 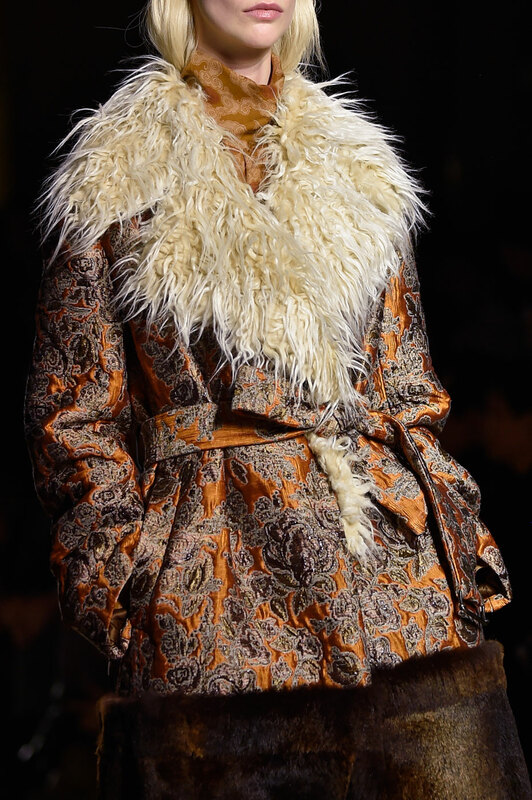 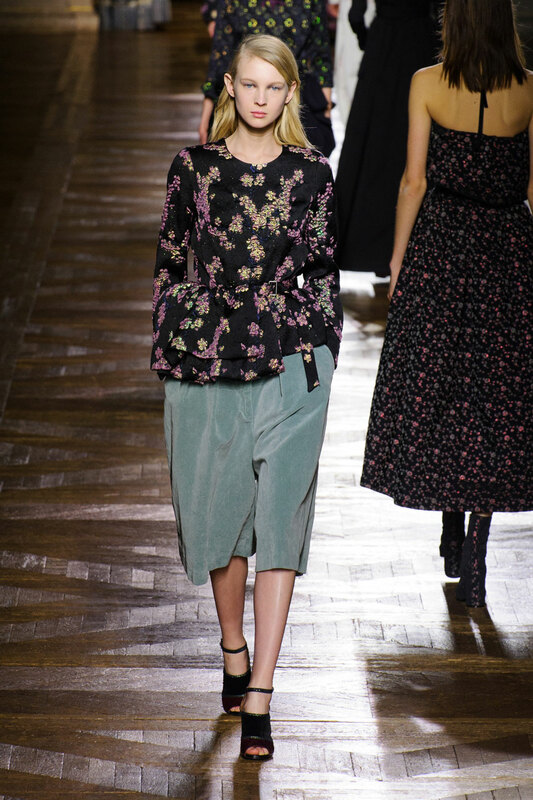 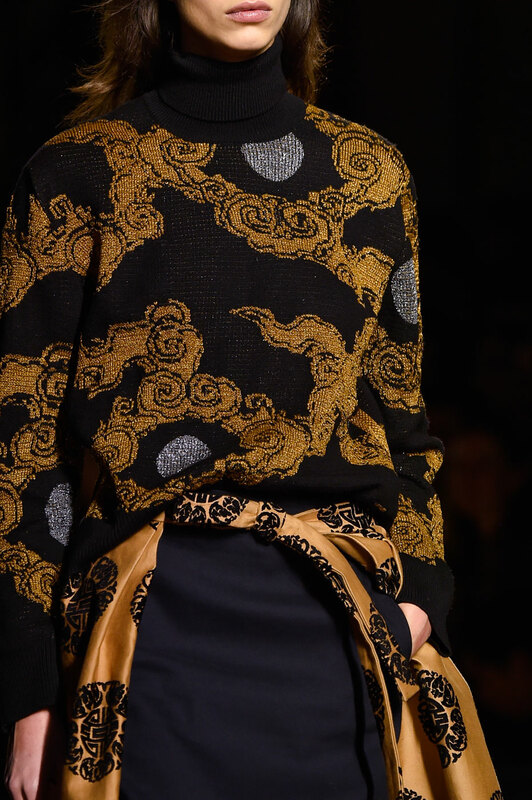 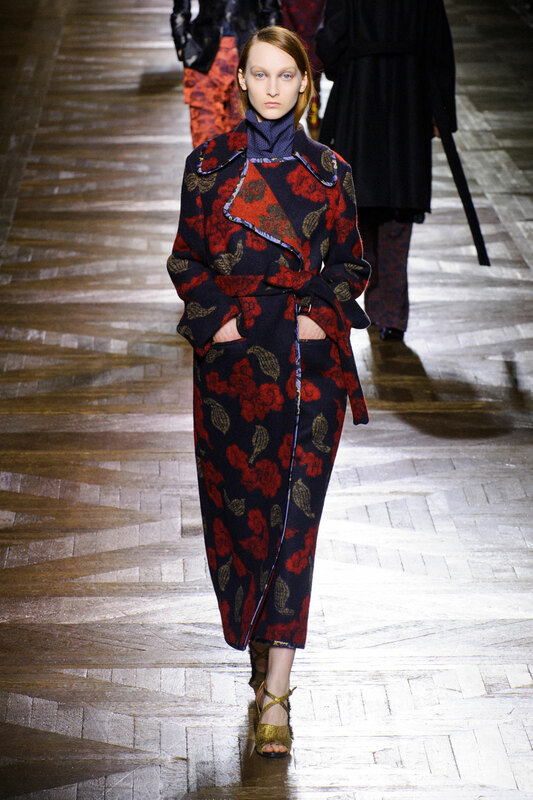 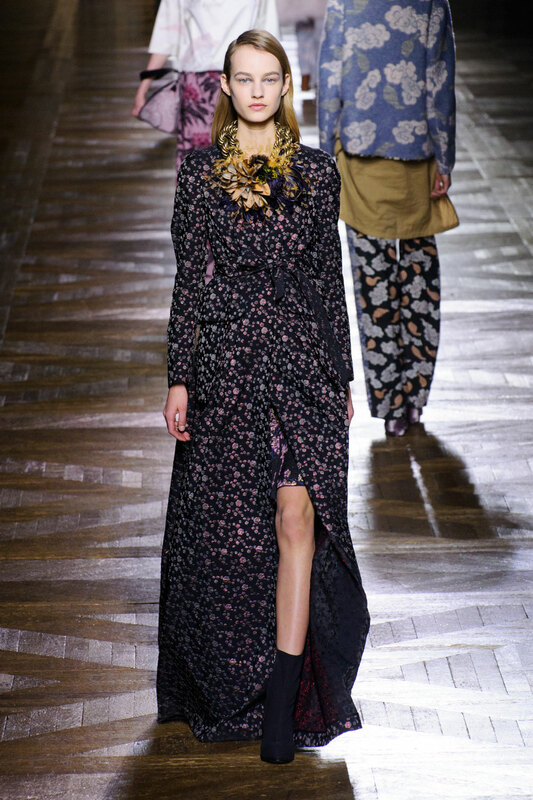 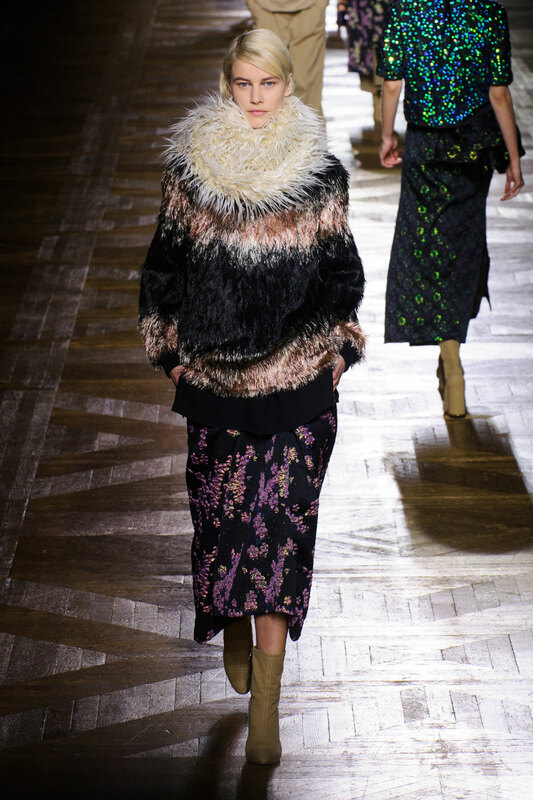 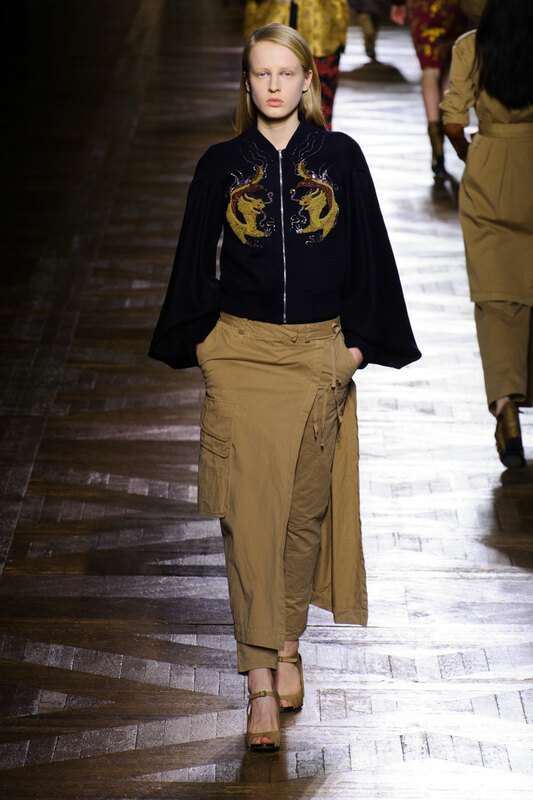 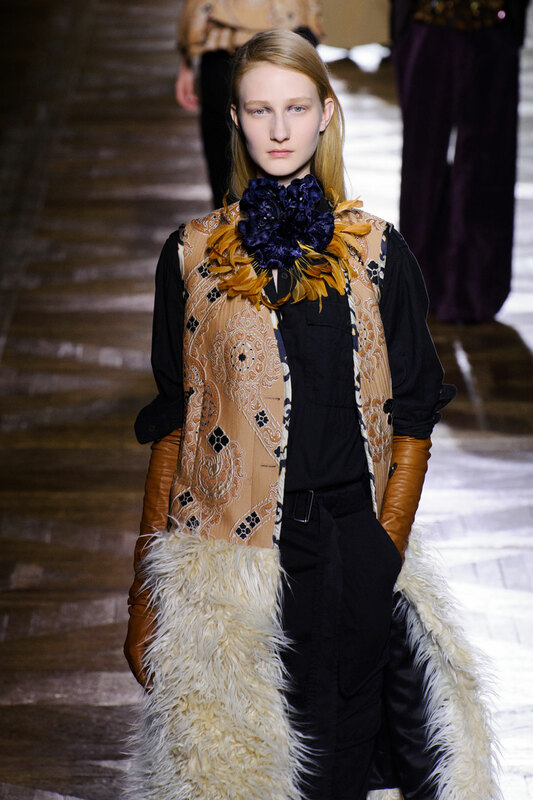 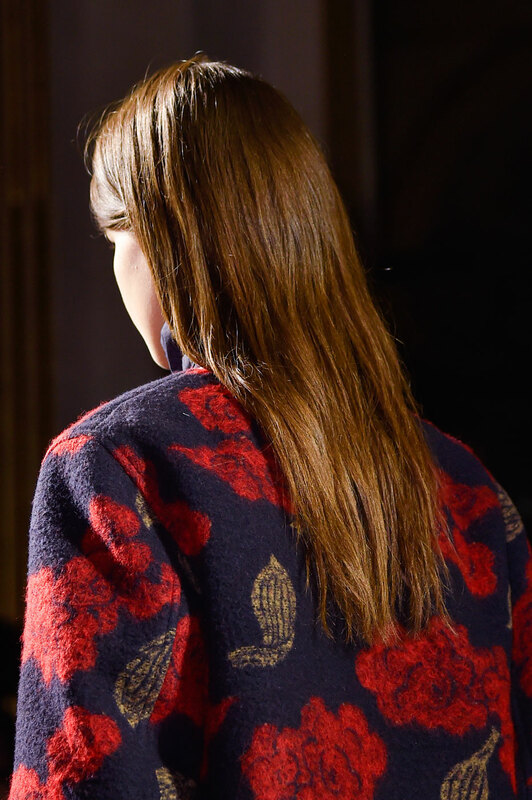 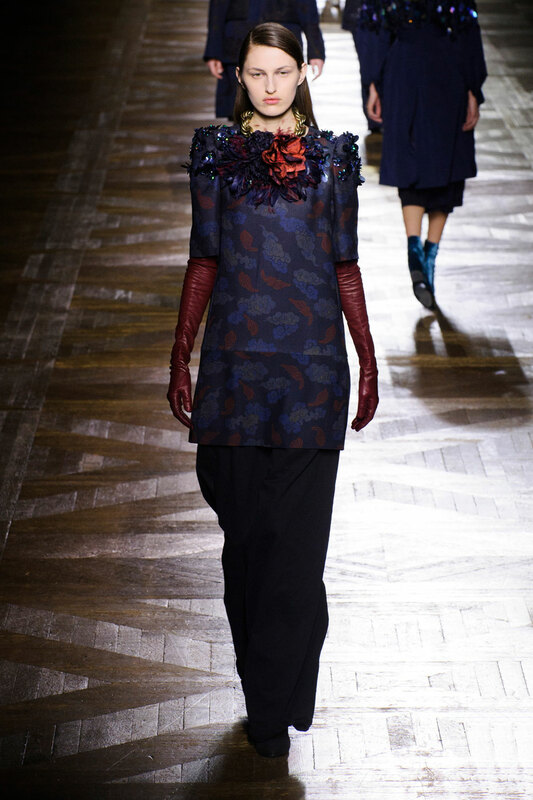 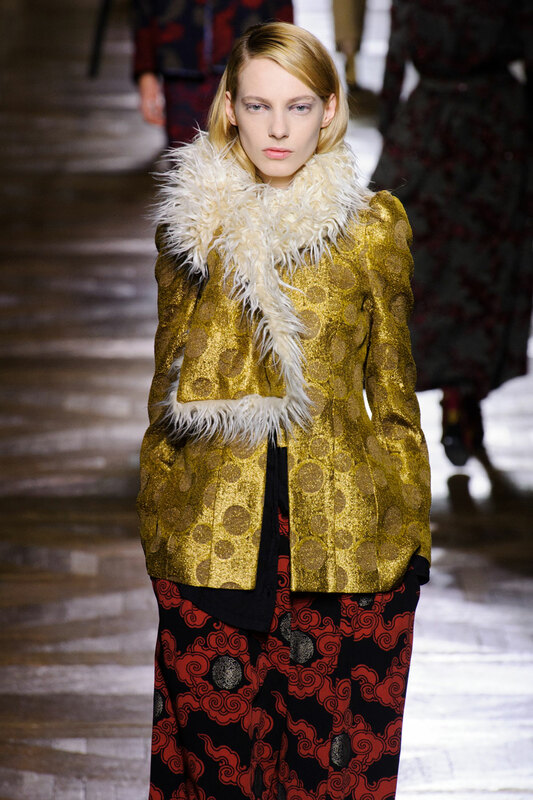 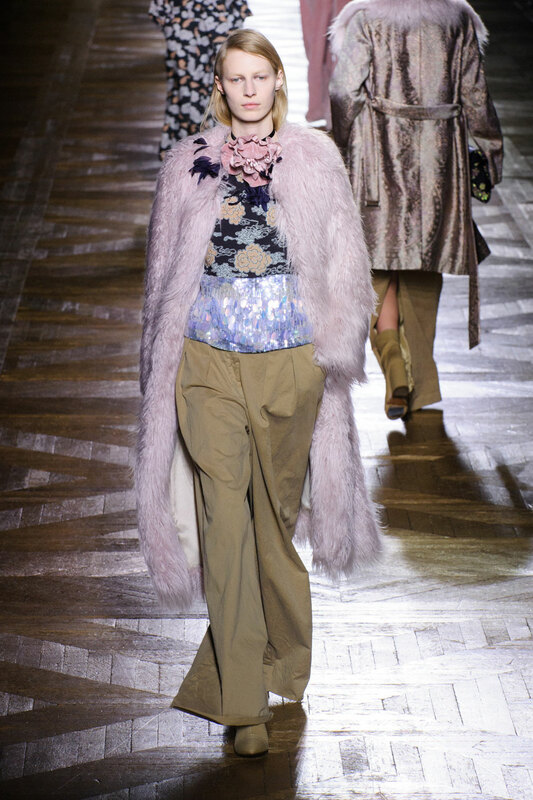 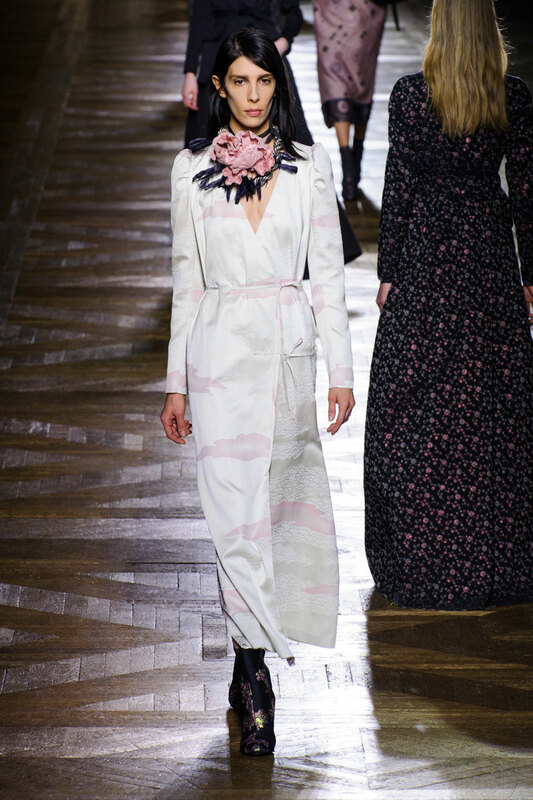 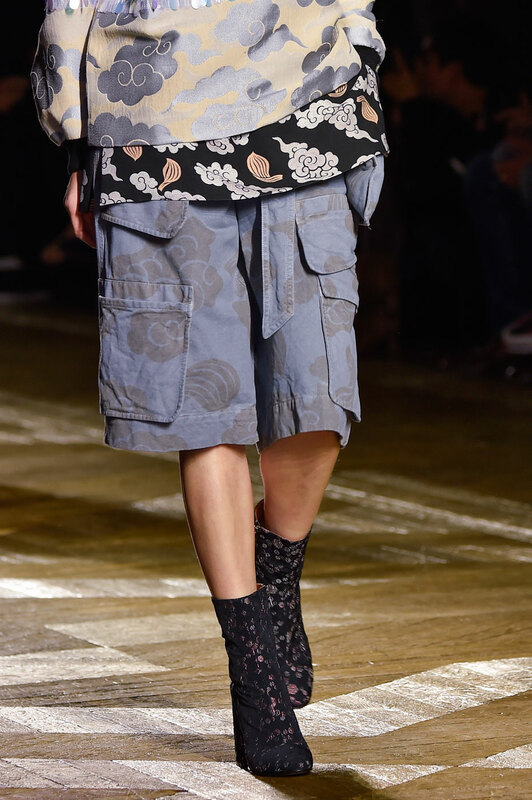 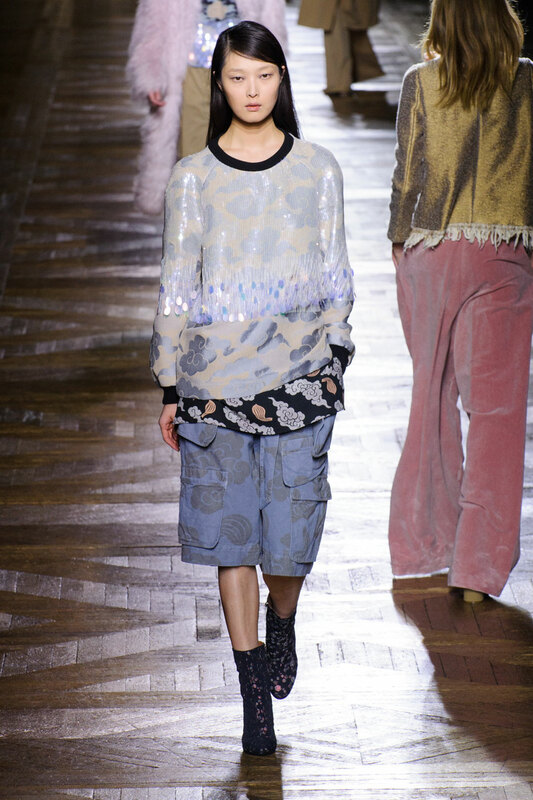 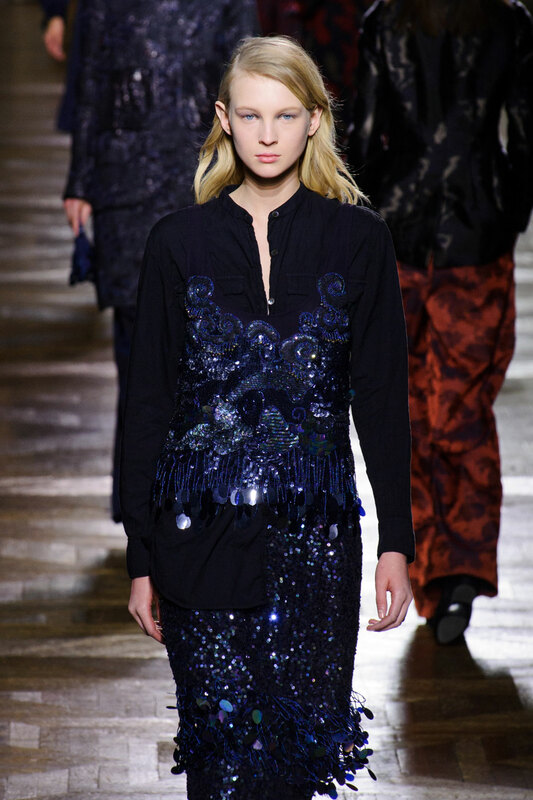 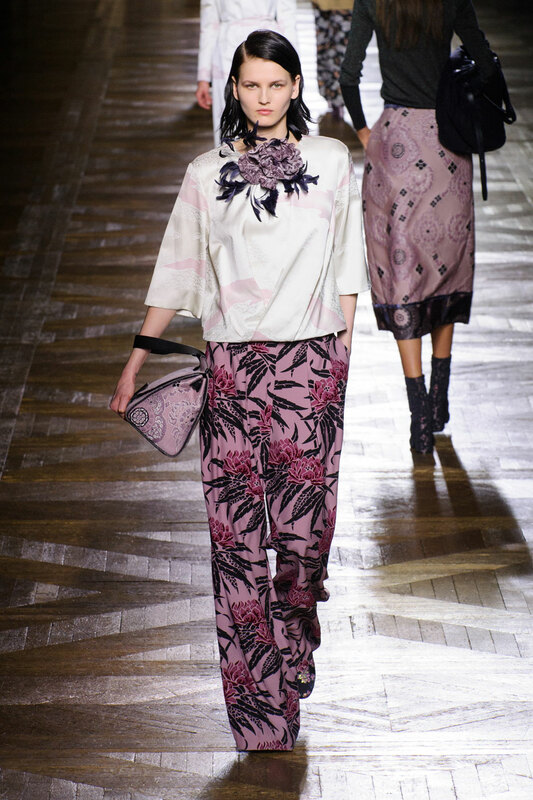 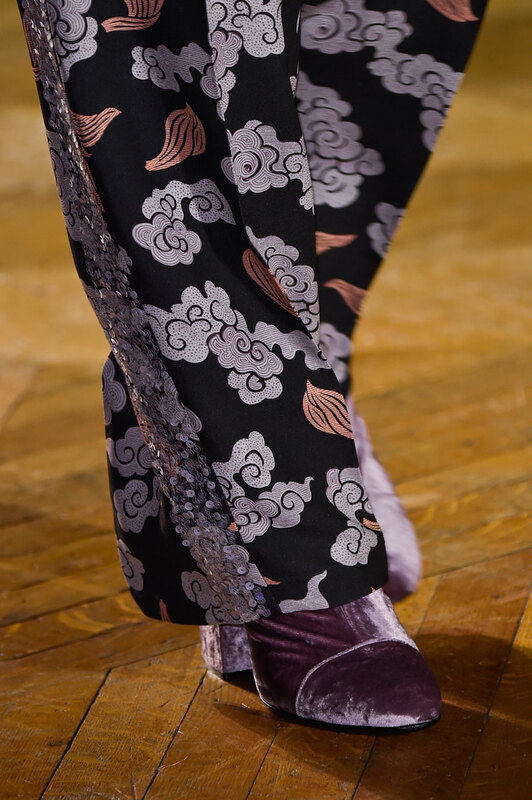 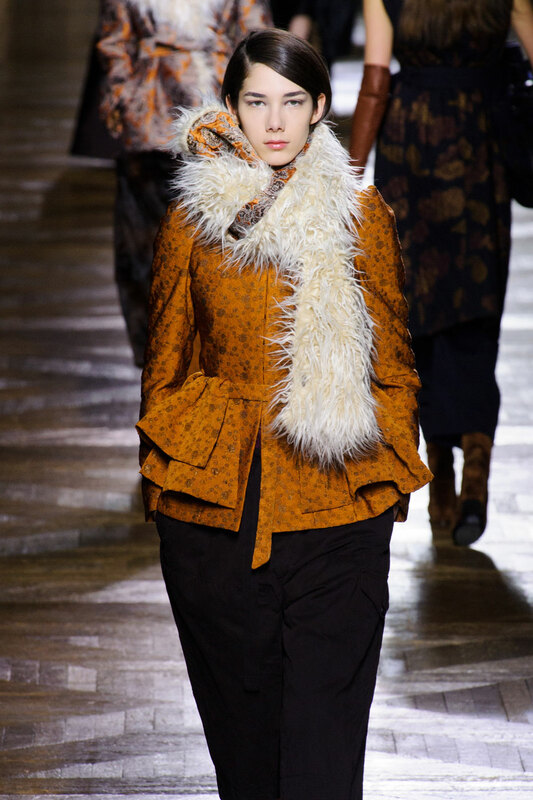 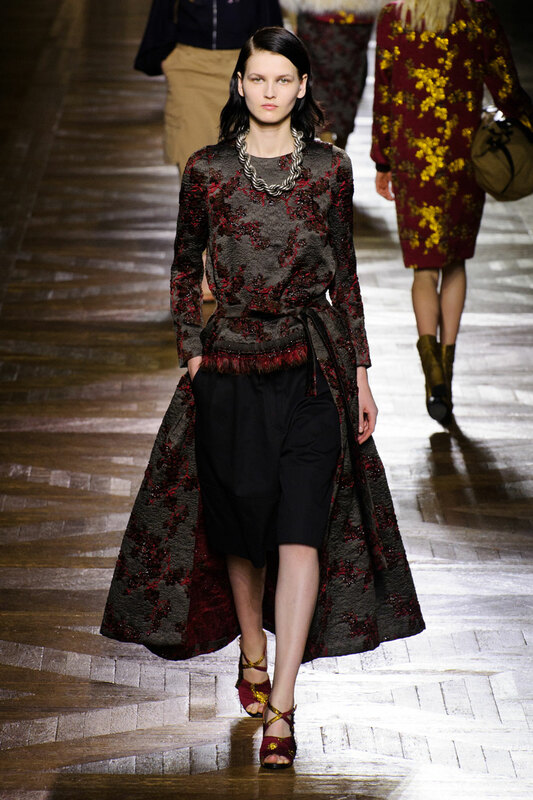 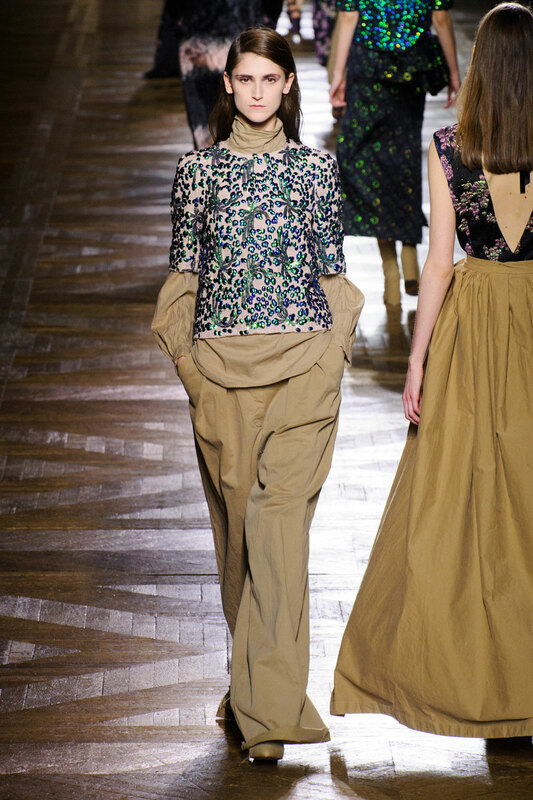 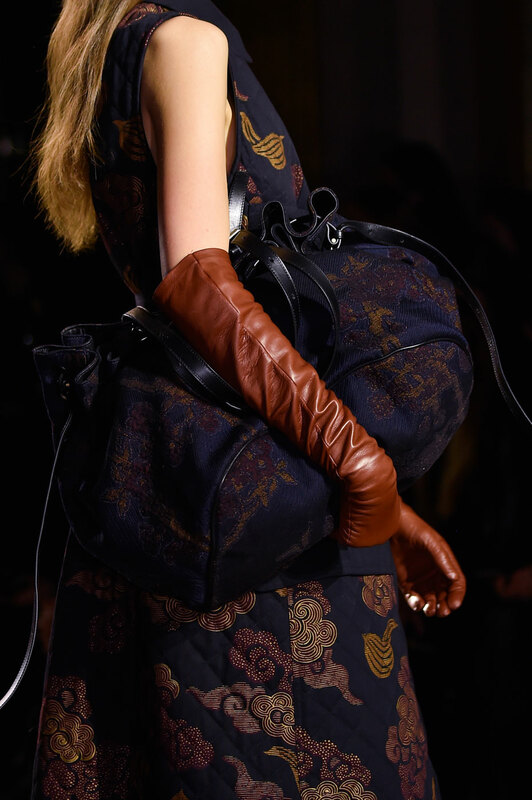 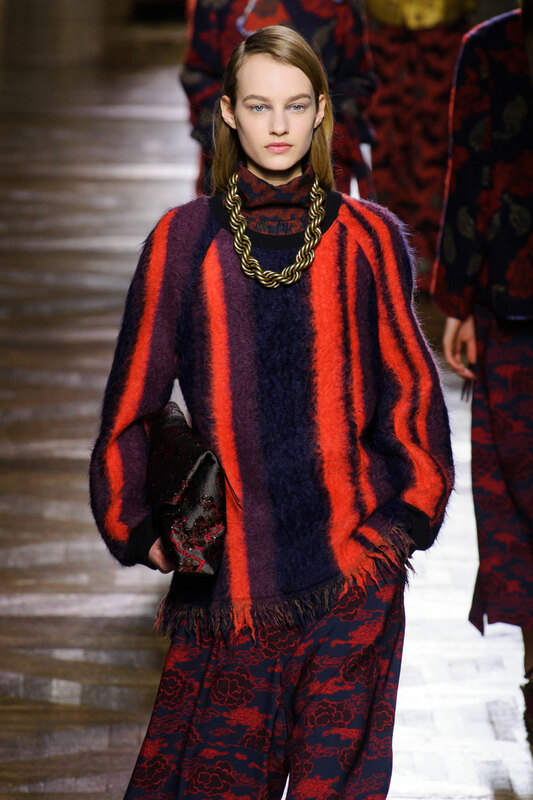 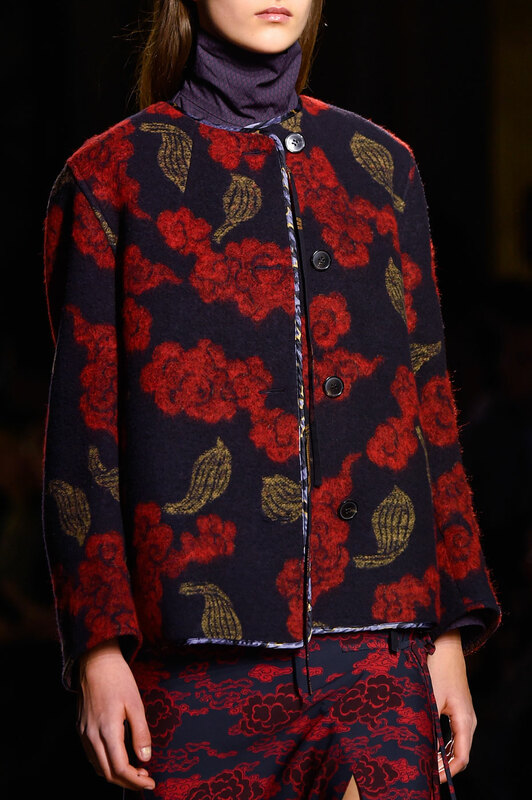 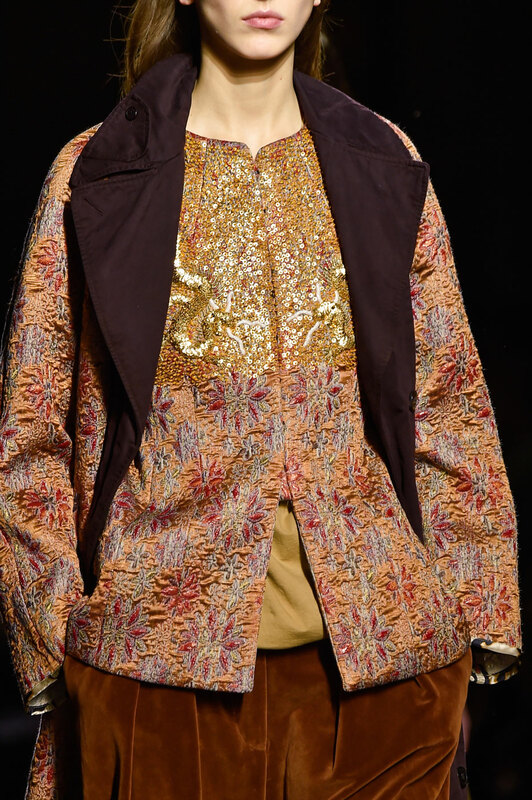 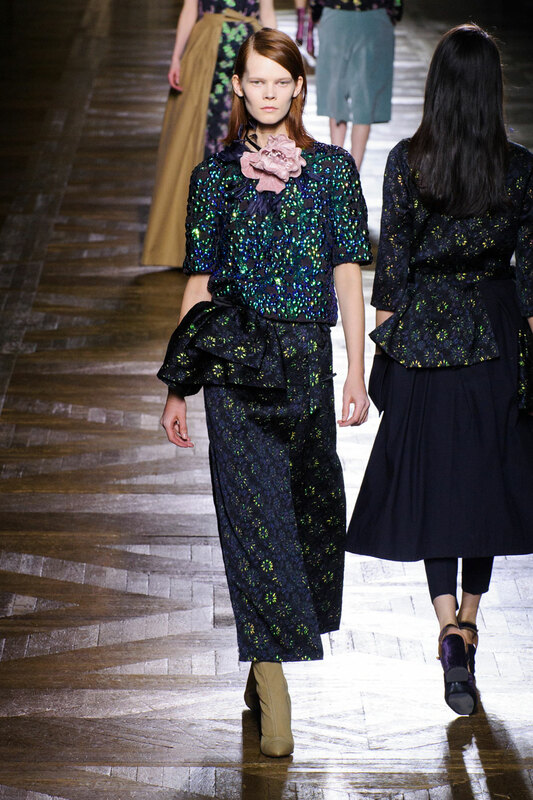 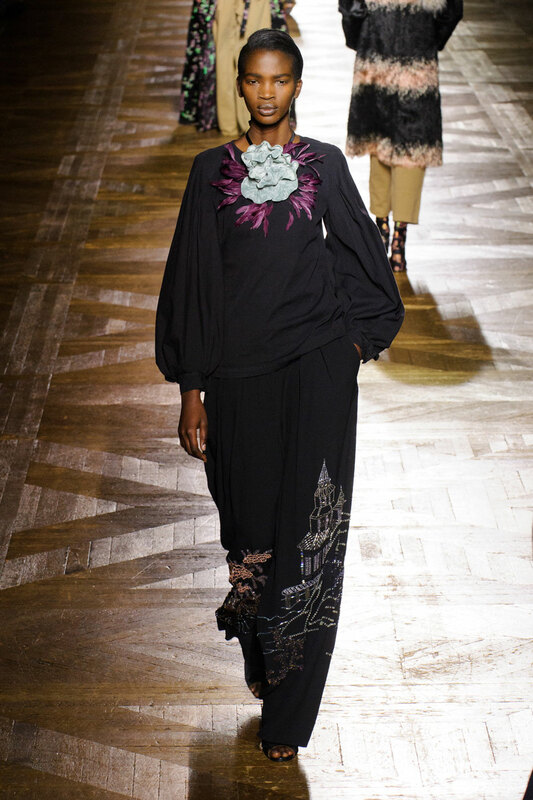 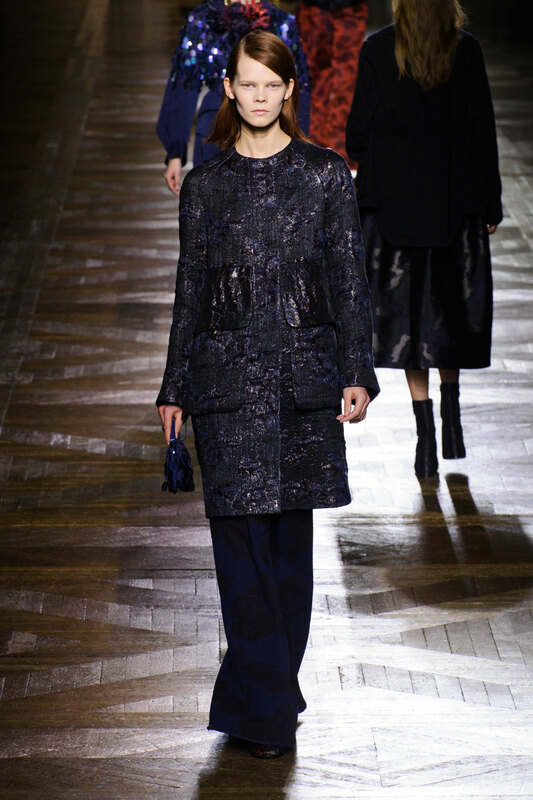 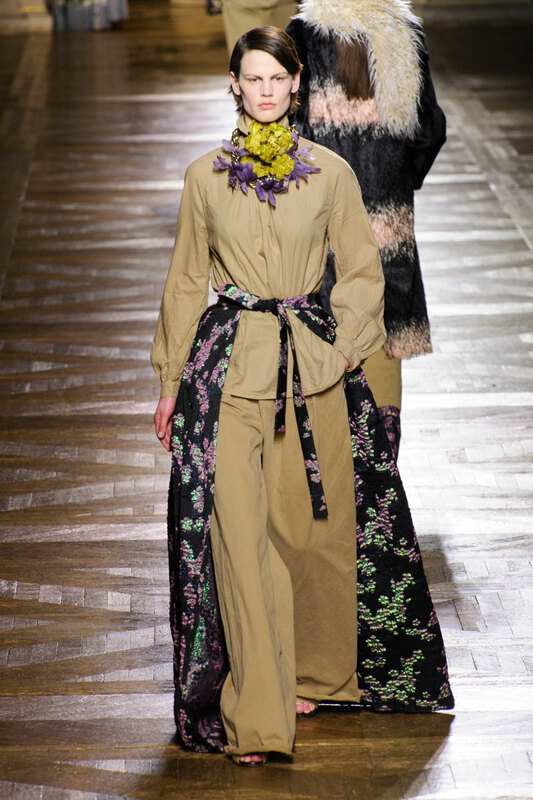 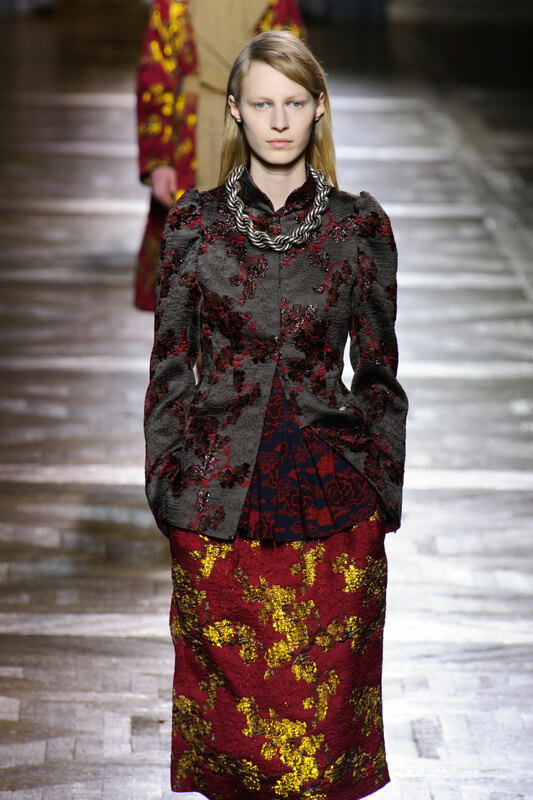 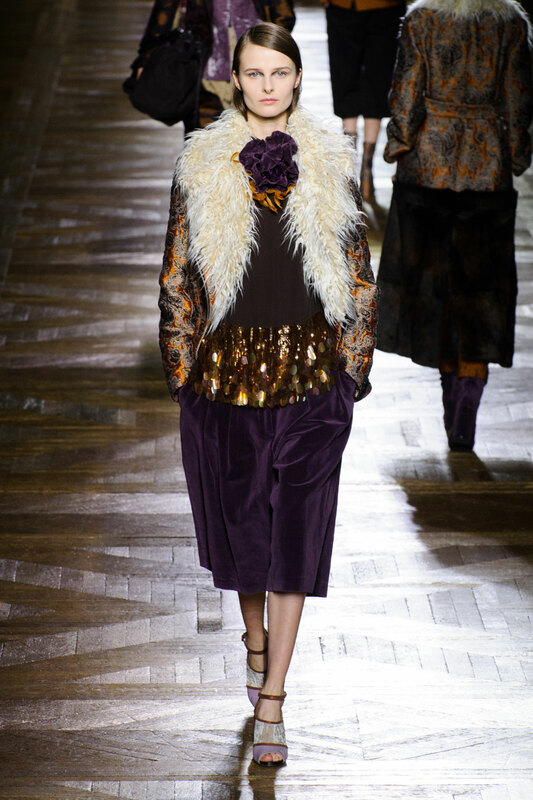 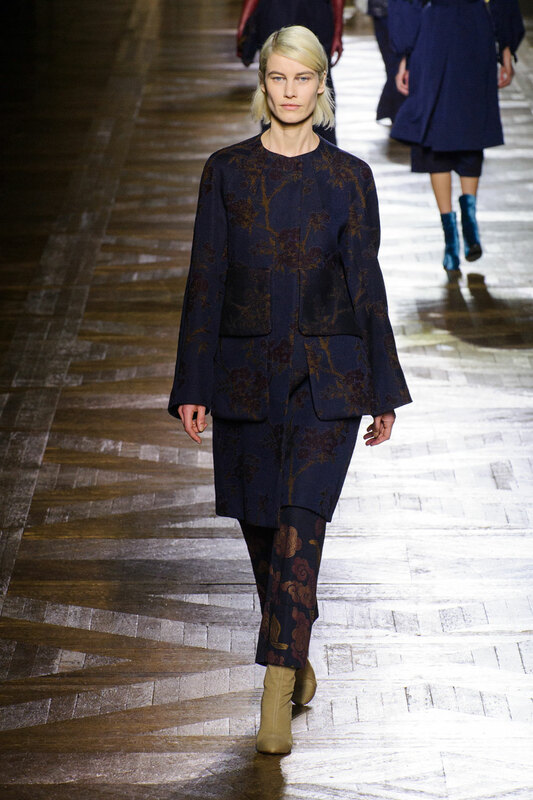 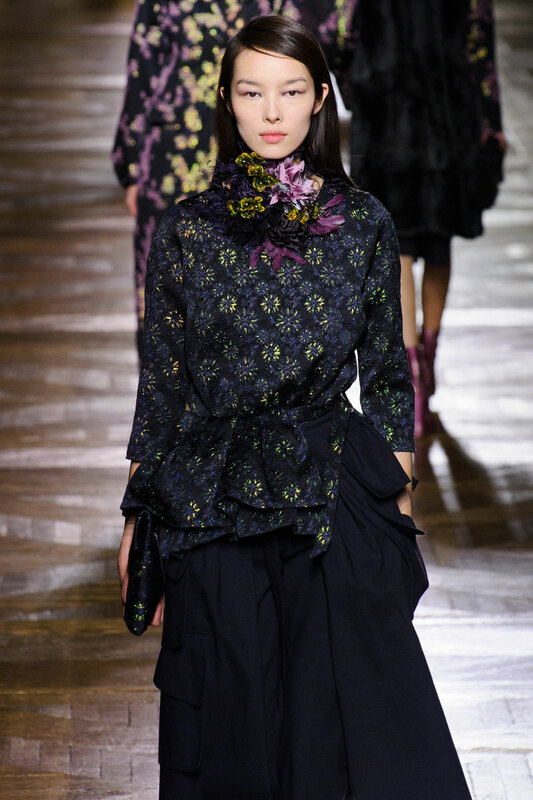 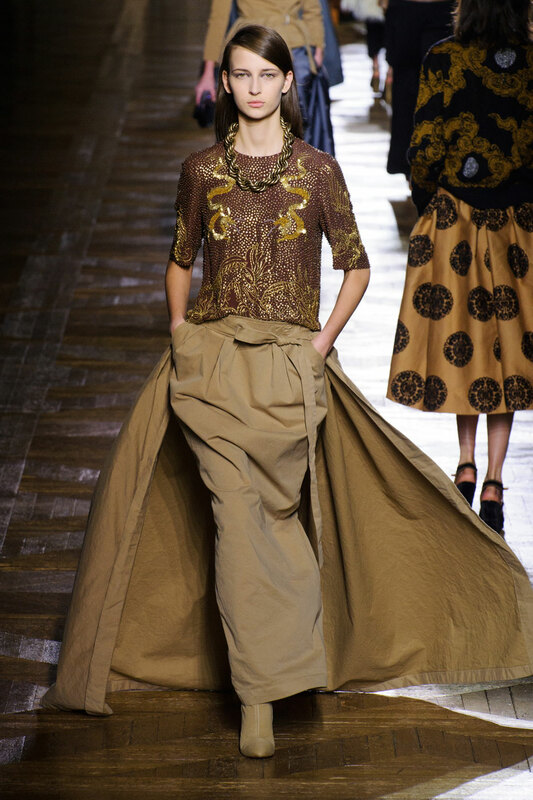 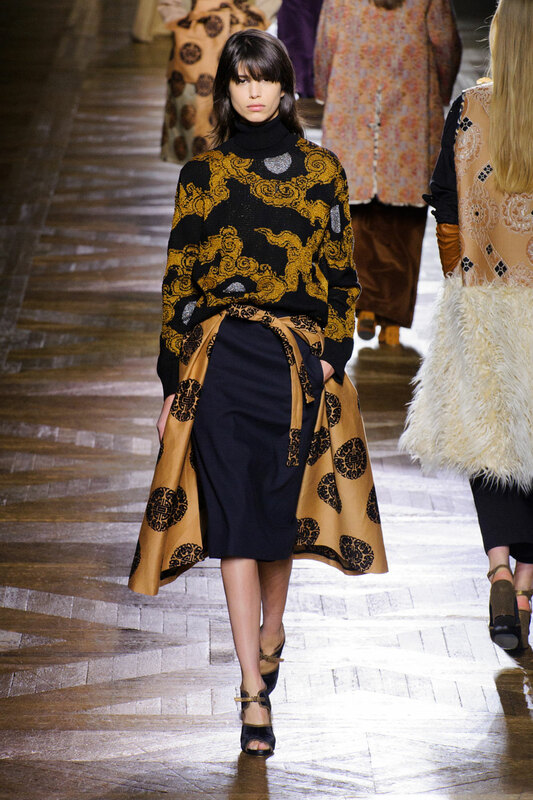 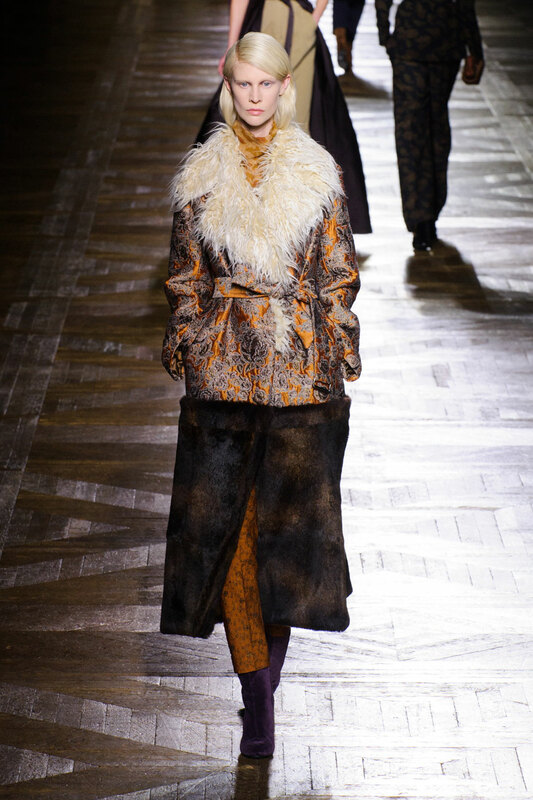 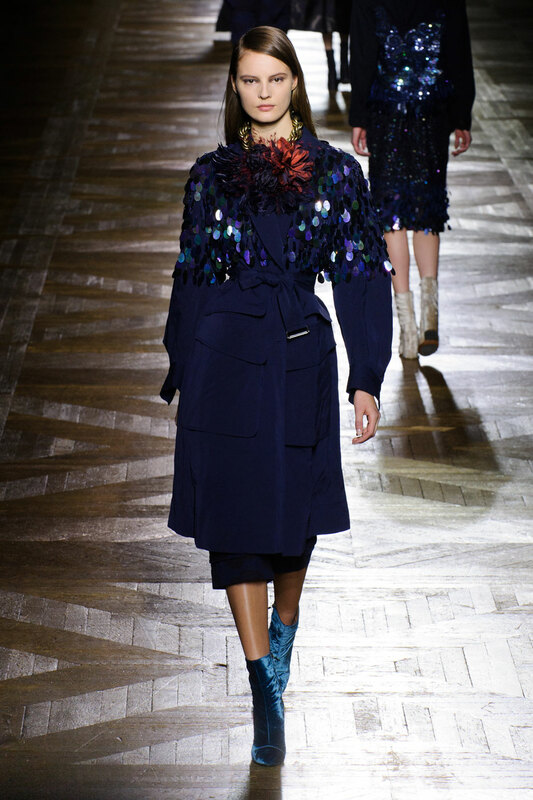 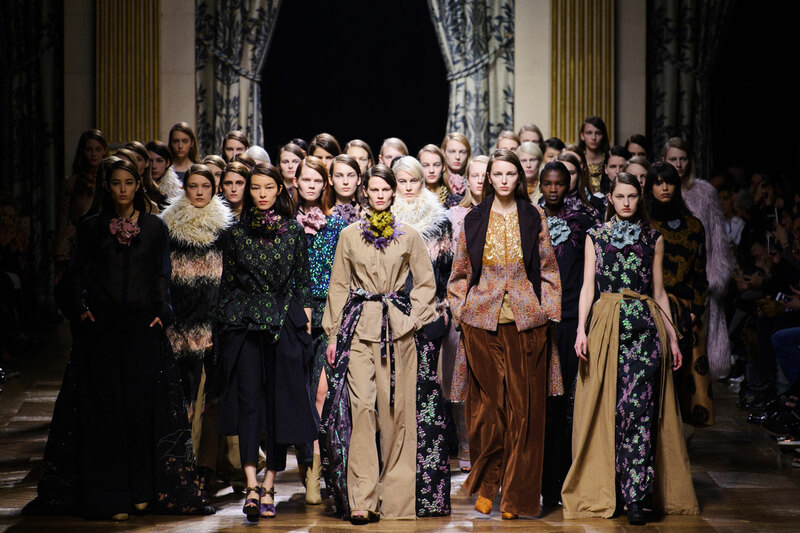 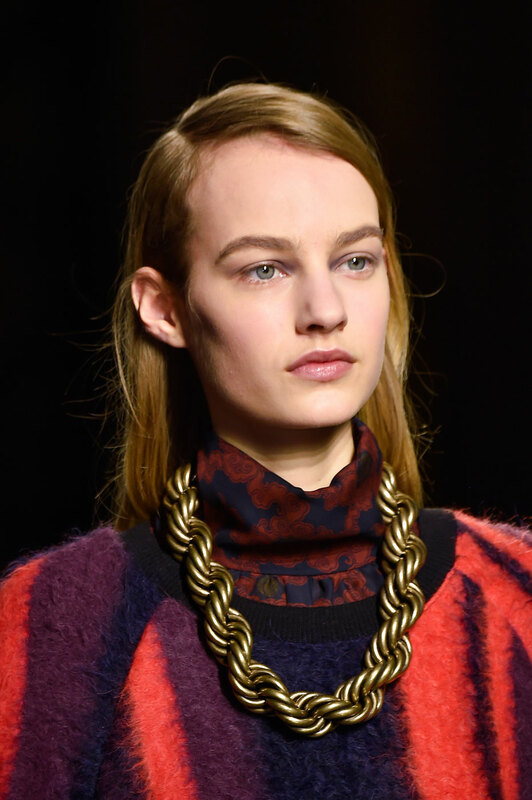 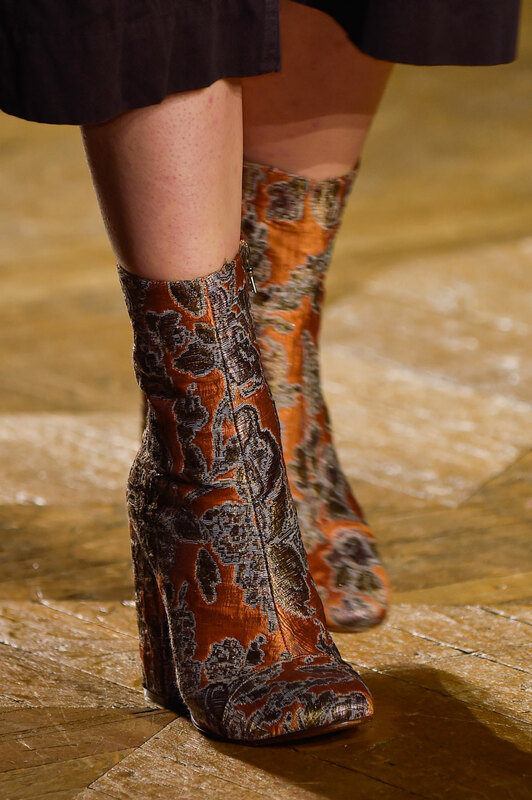 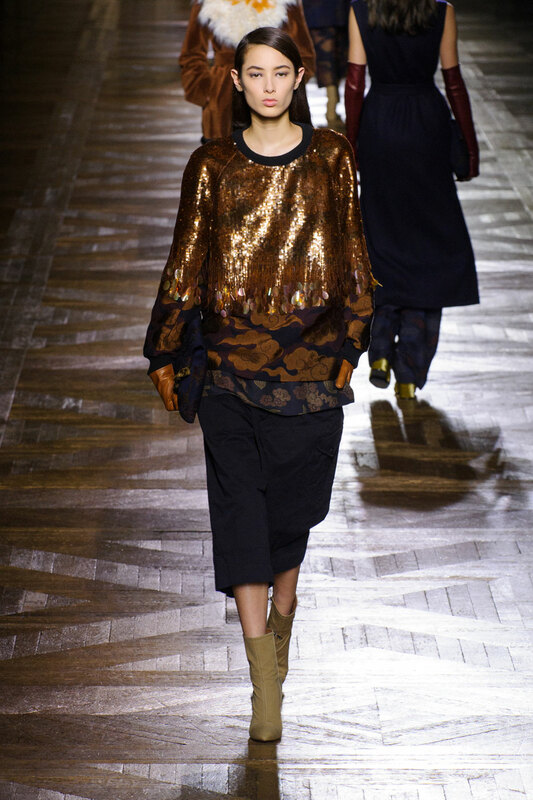 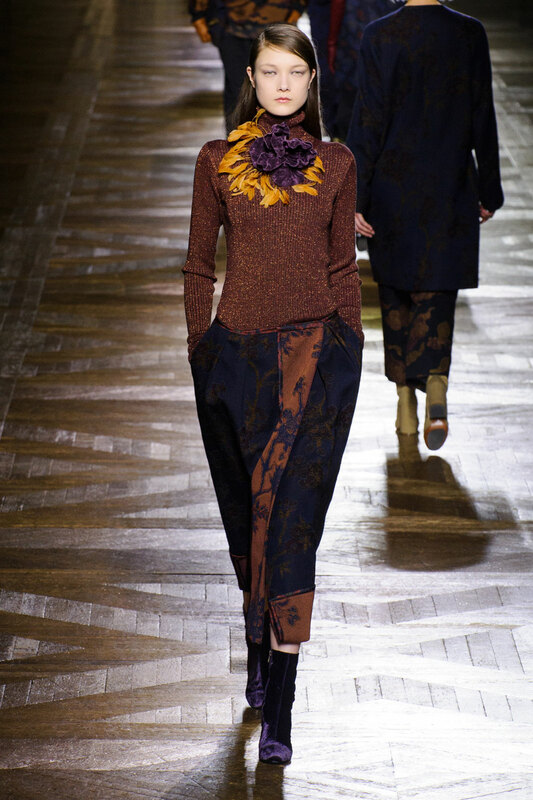 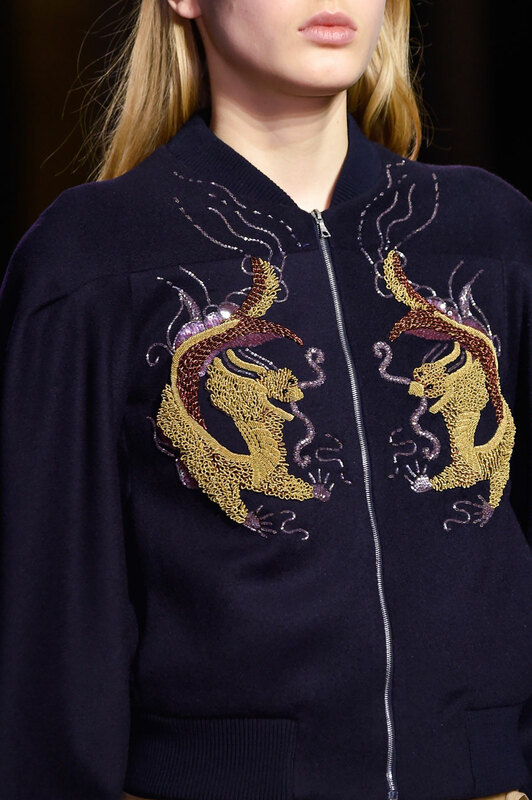 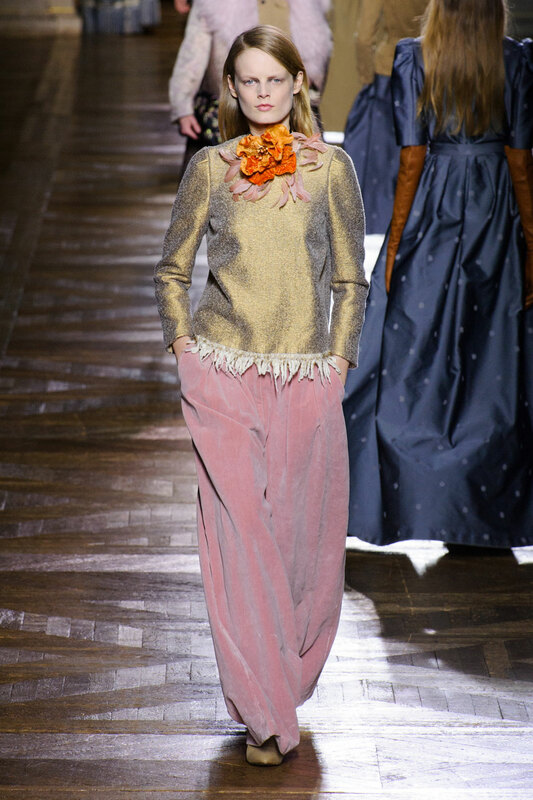 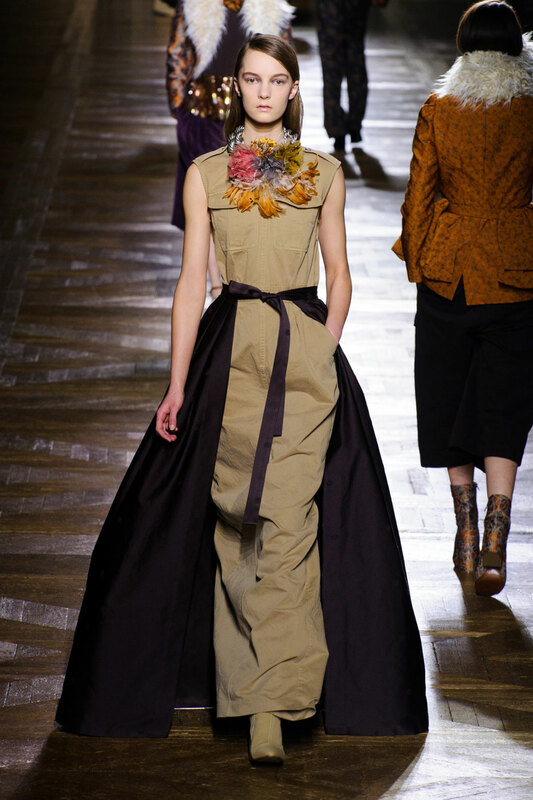 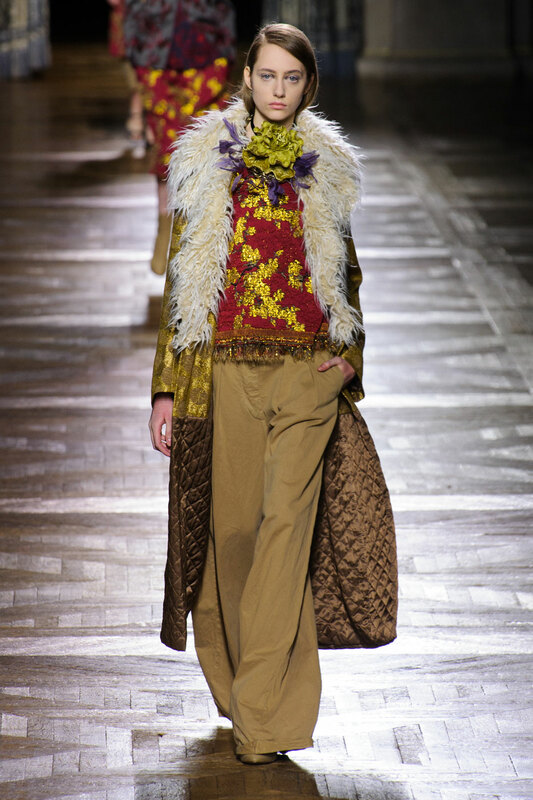 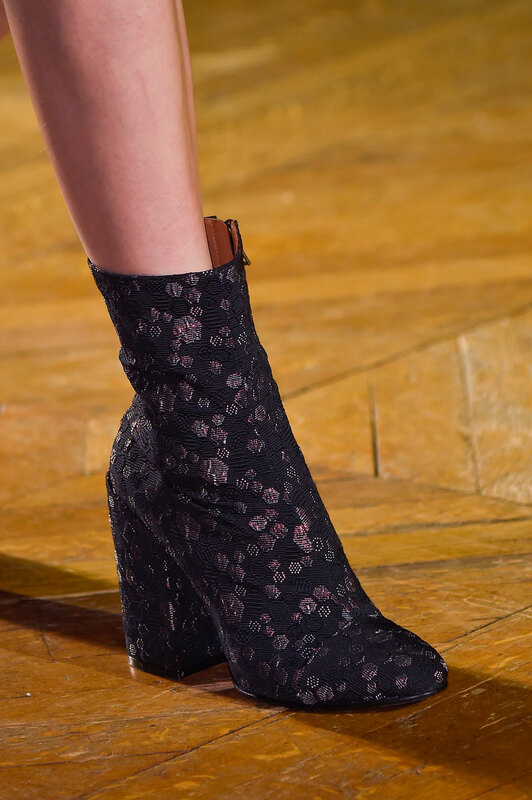 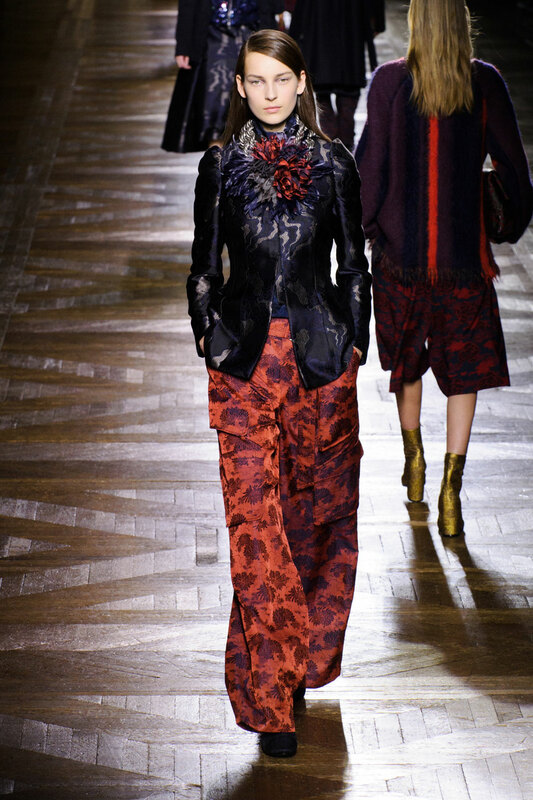 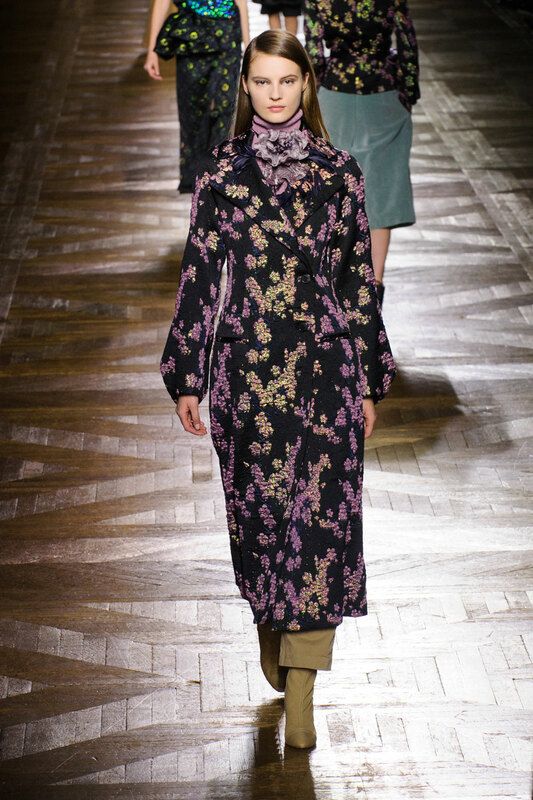 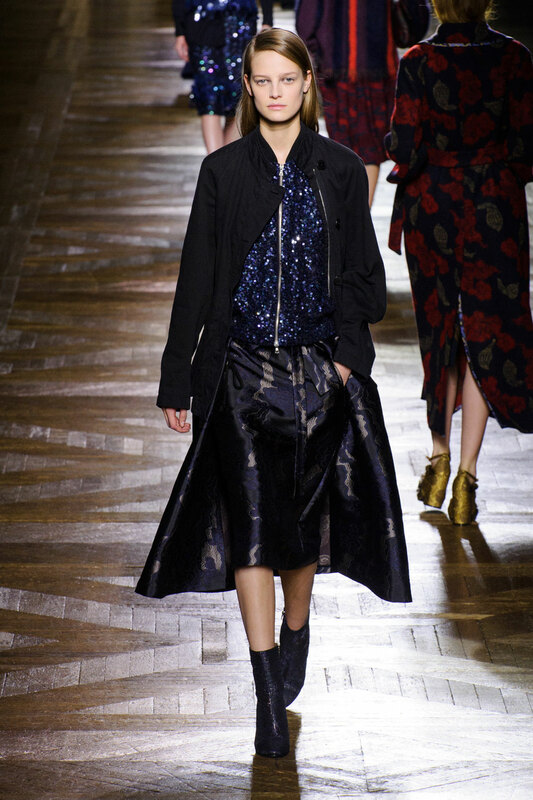 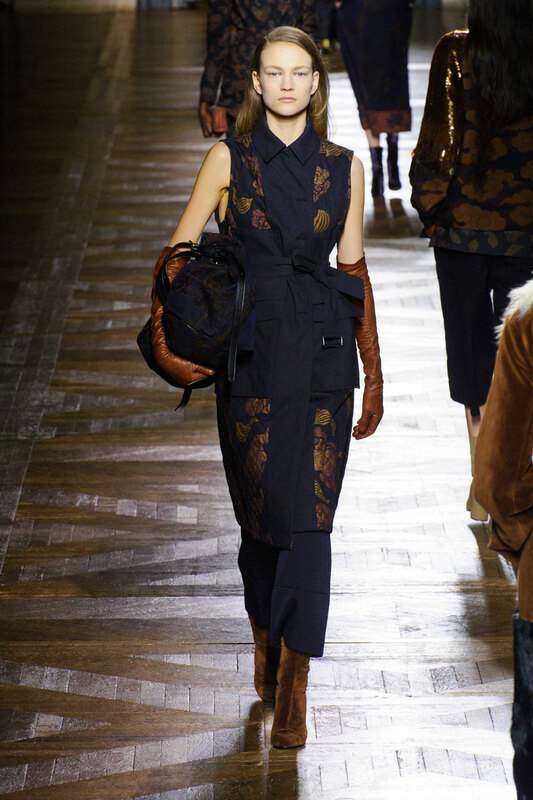 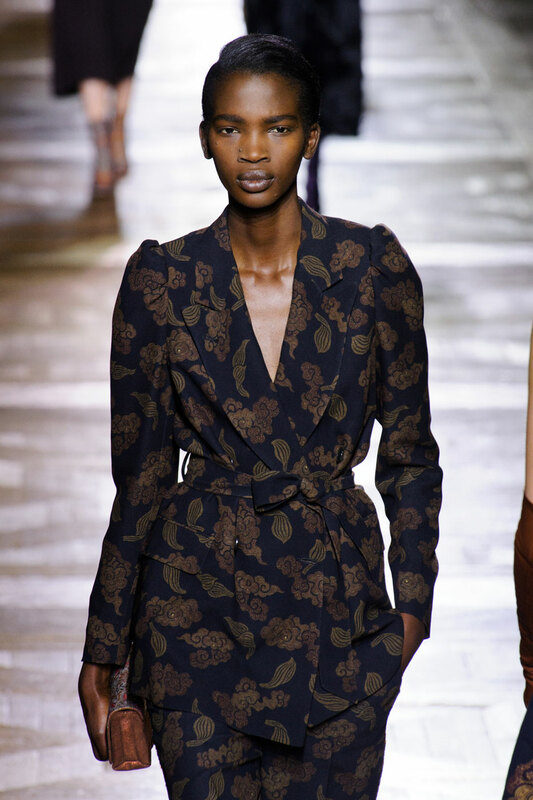 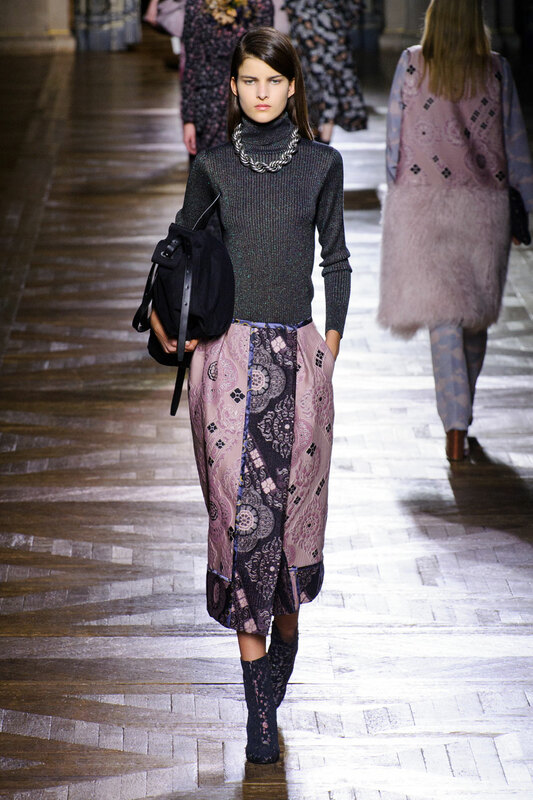 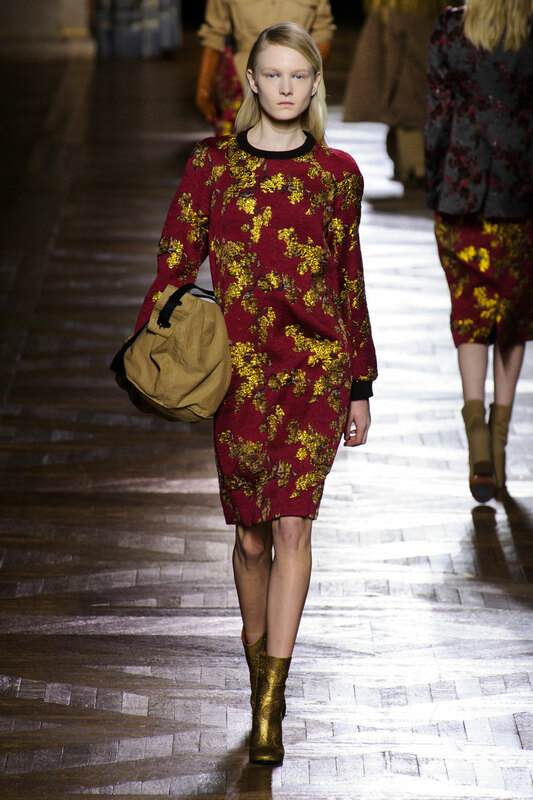 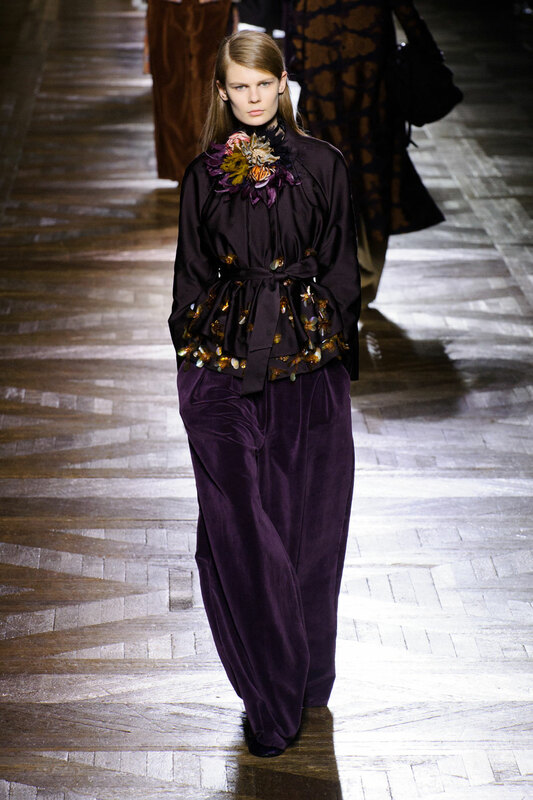 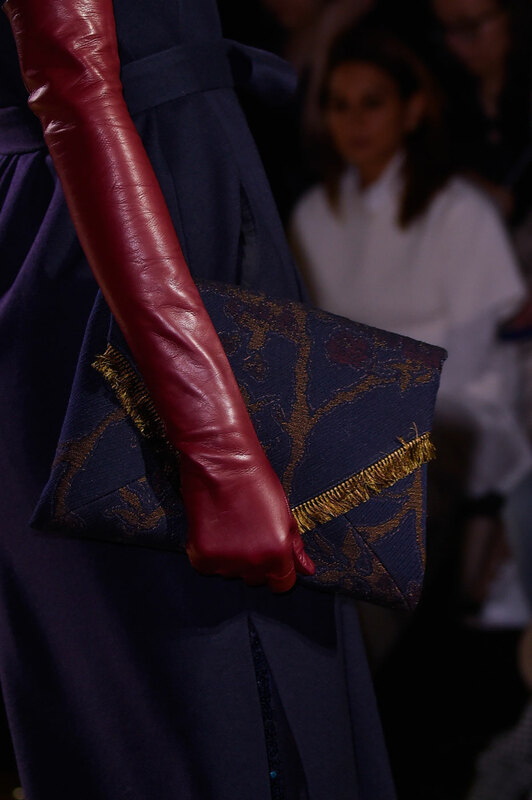 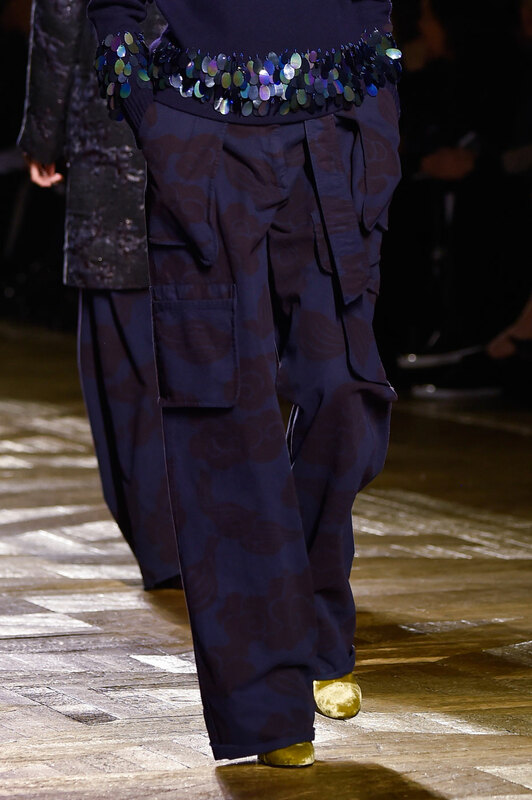 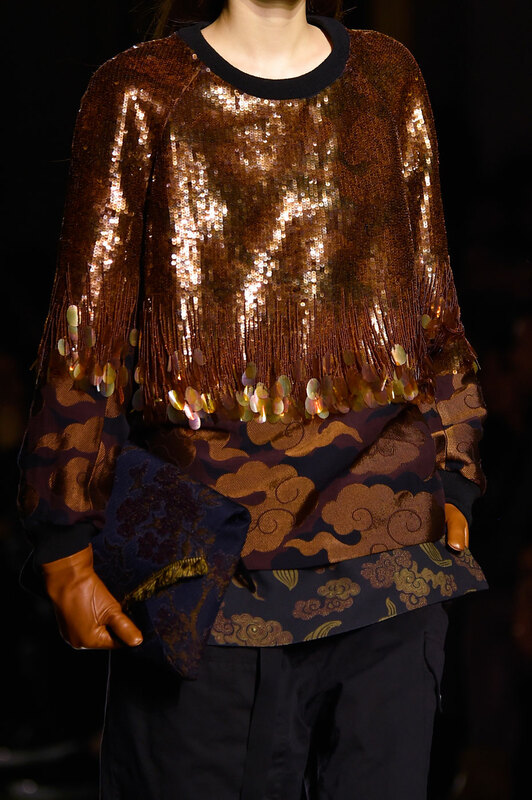 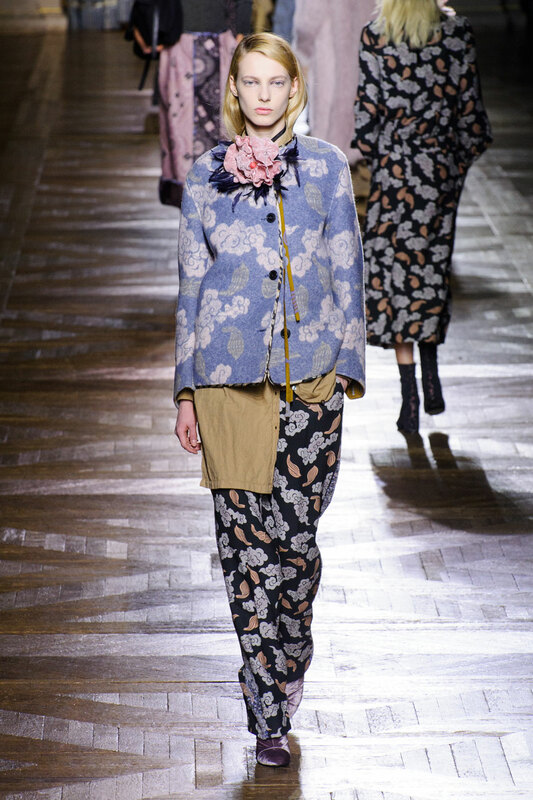 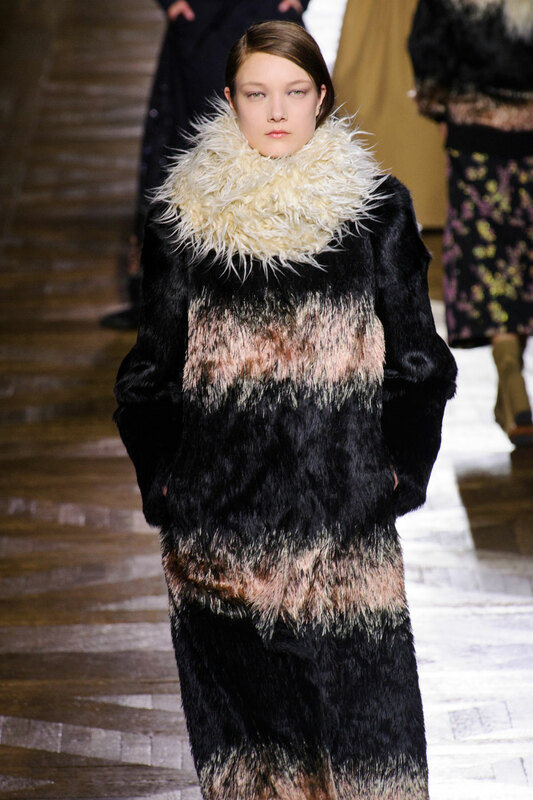 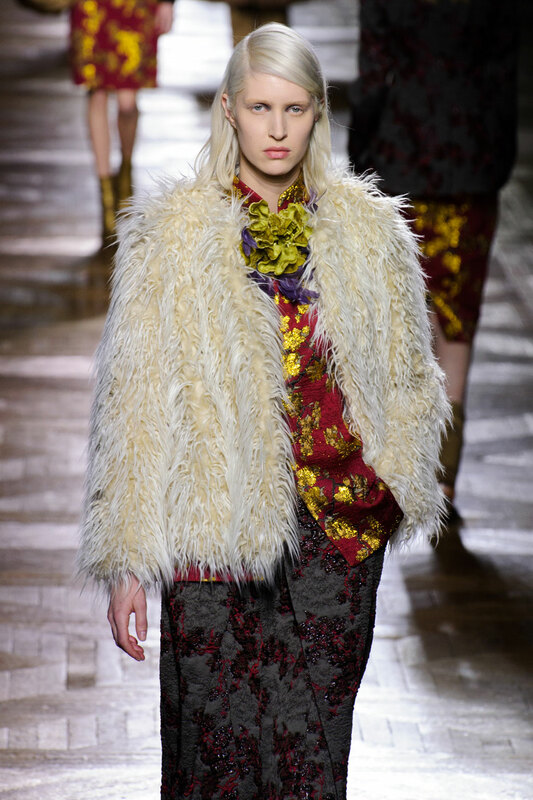 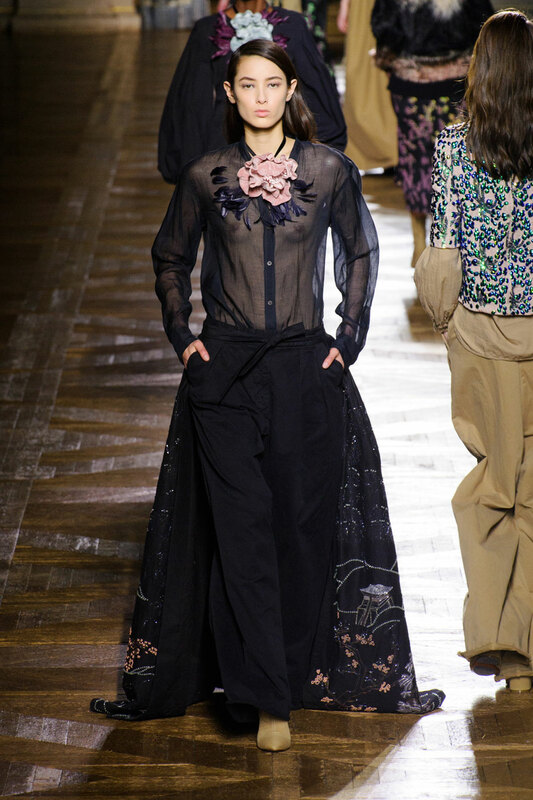 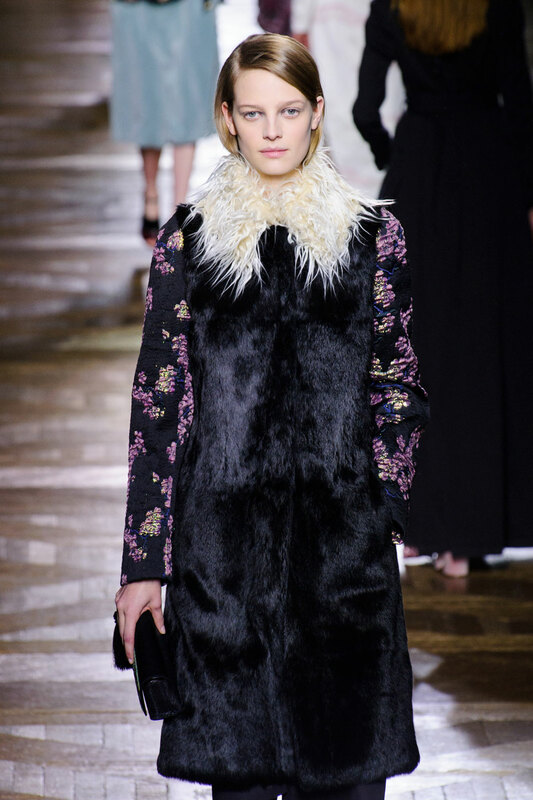 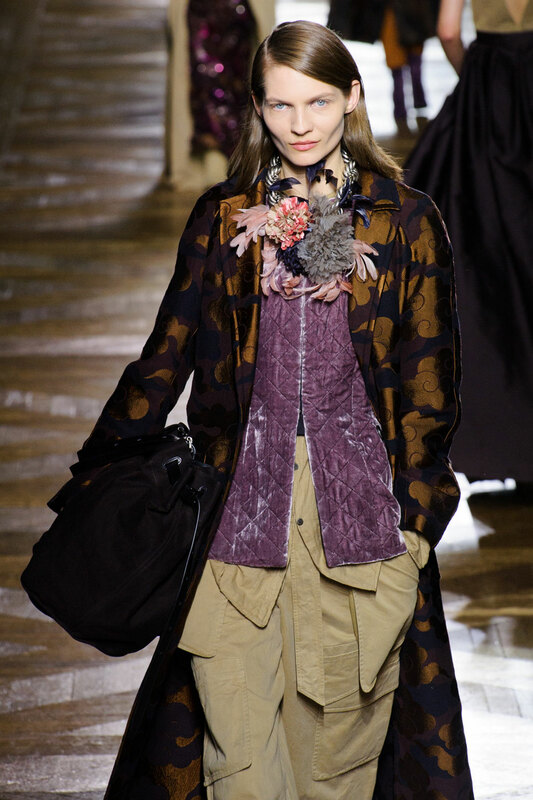 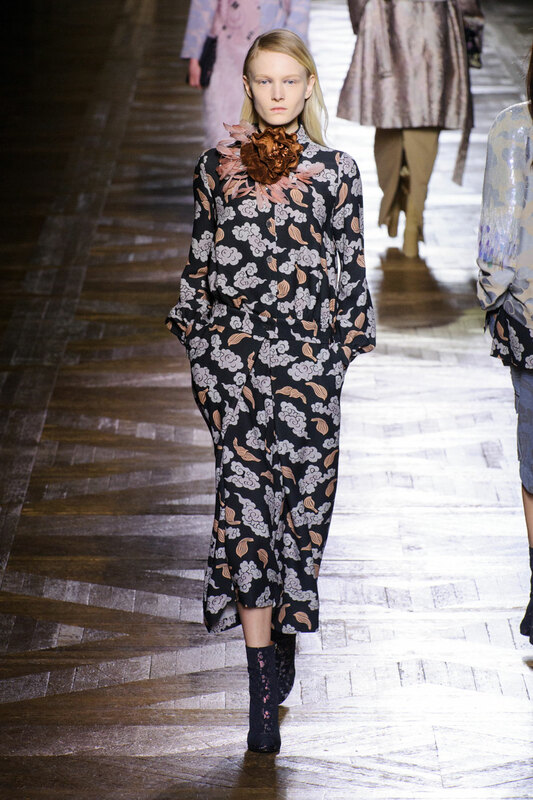 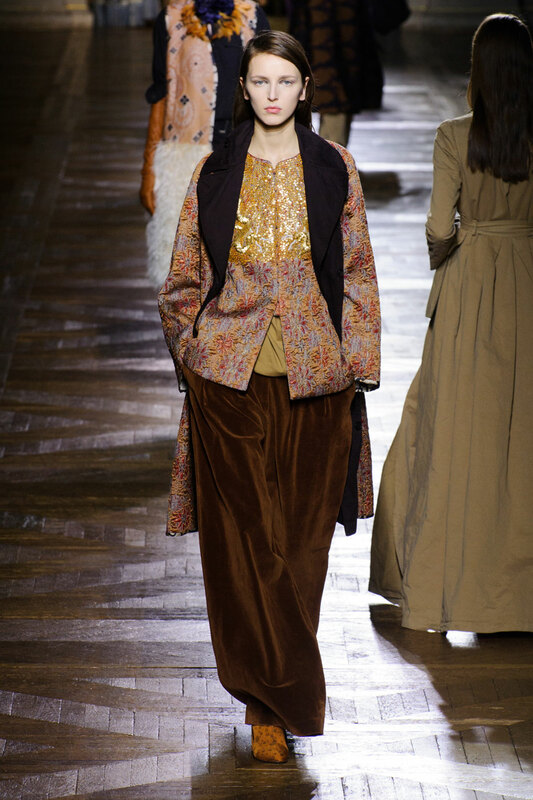 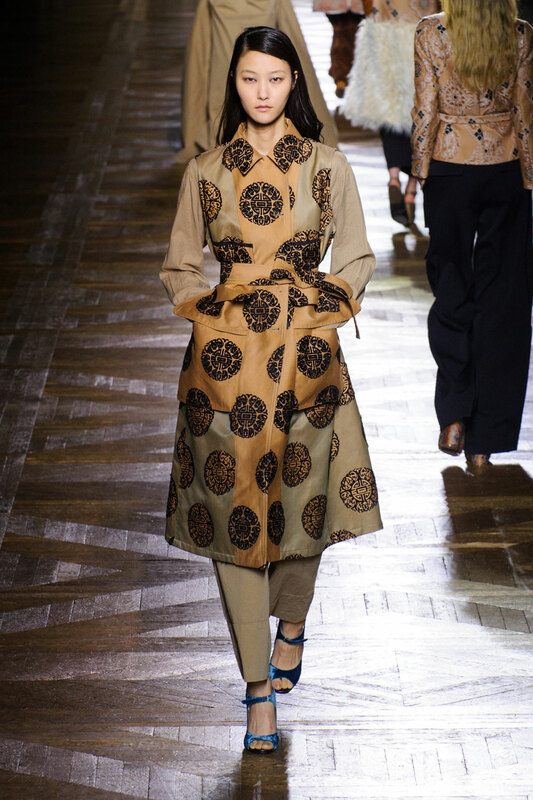 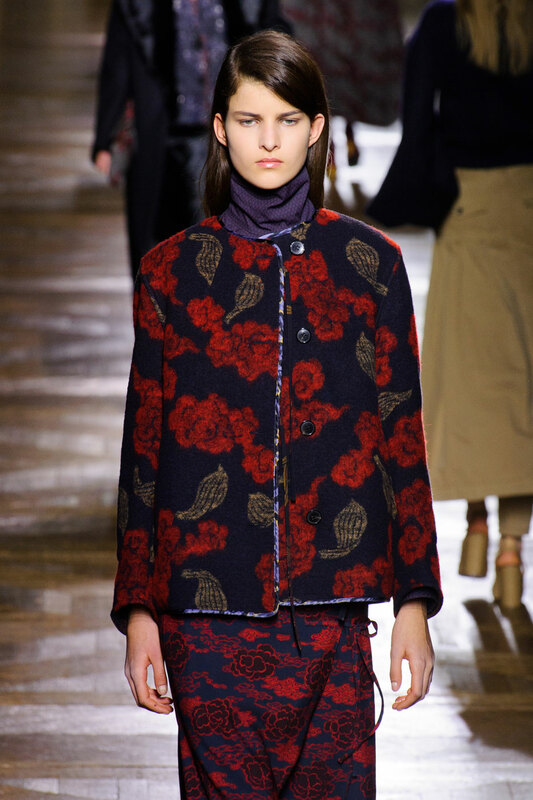 Dries Van Noten Women Autumn-Winter 2015 – Renowned for layering conflicting patterns with strong, streamlined tailoring and bespoke touches, Dries Van Noten put on a spectacular show in true Van Noten style. 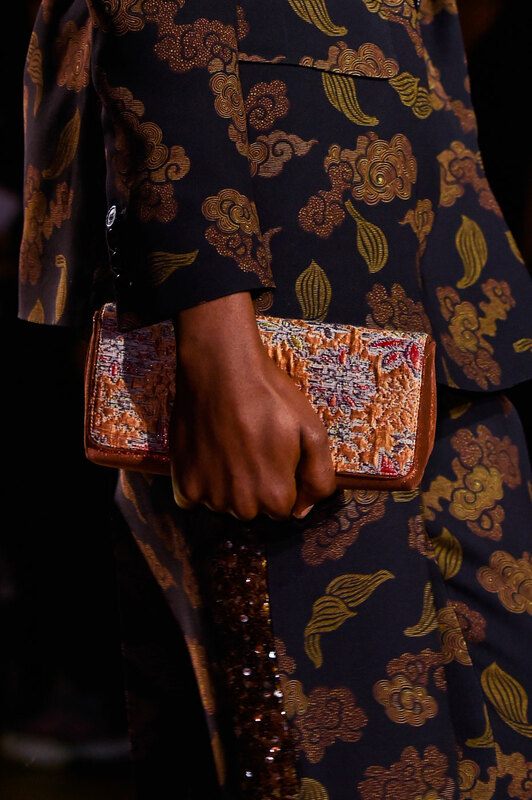 Juxtaposing different fabrics and patterns like no other. 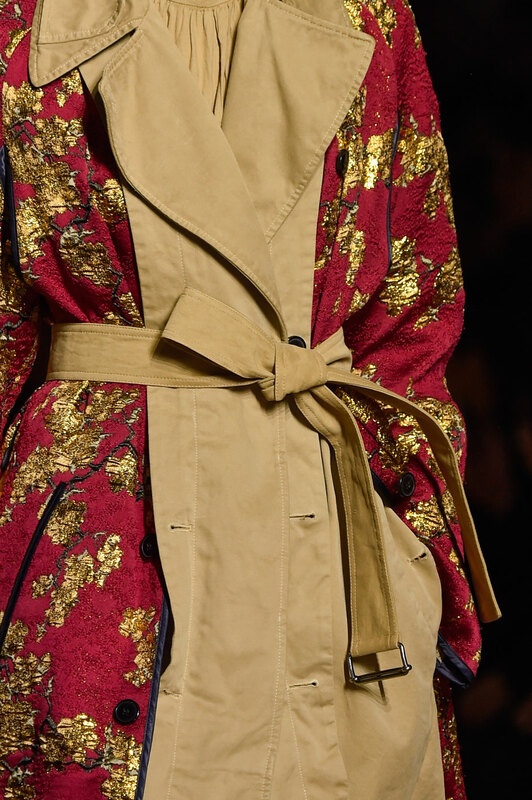 Kimono master, meets military general in an East meets West collection, with belted coats, shirt dresses and embroidered dragons. 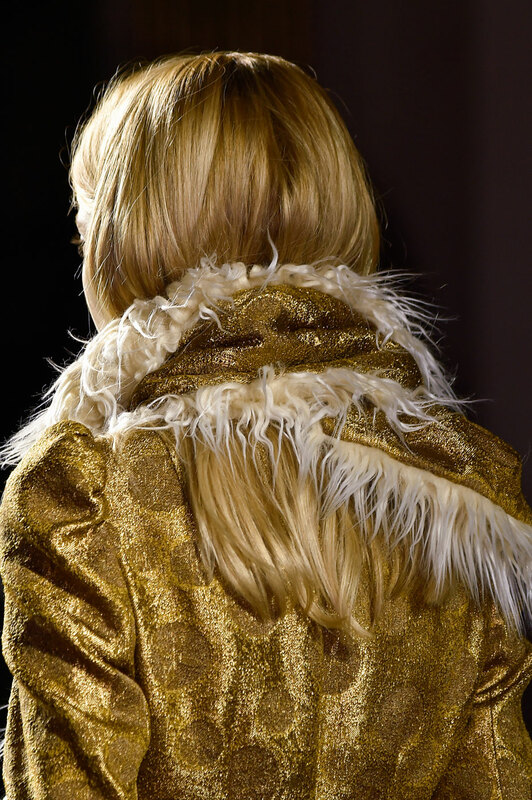 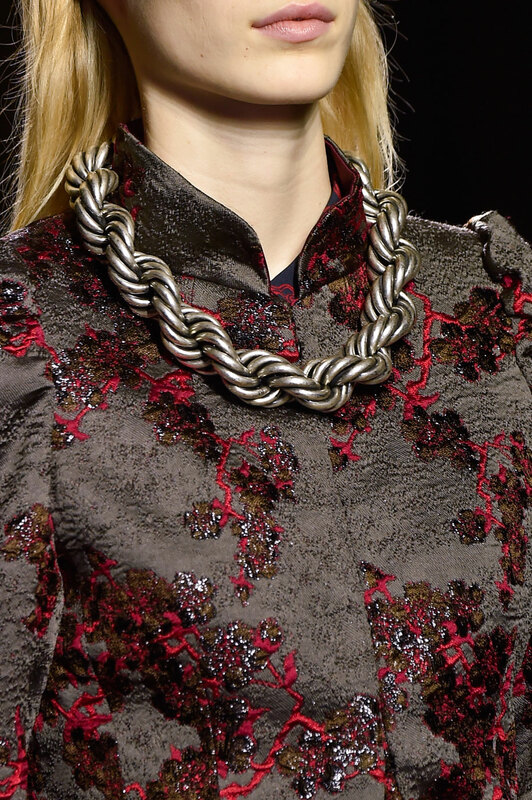 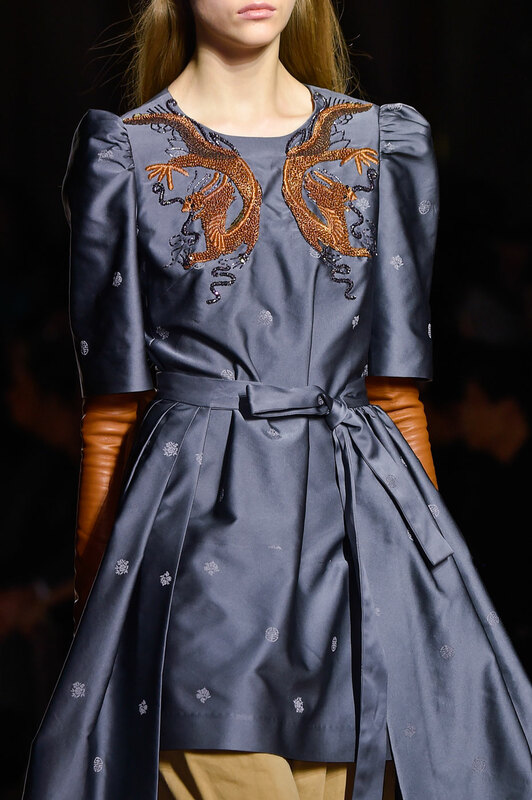 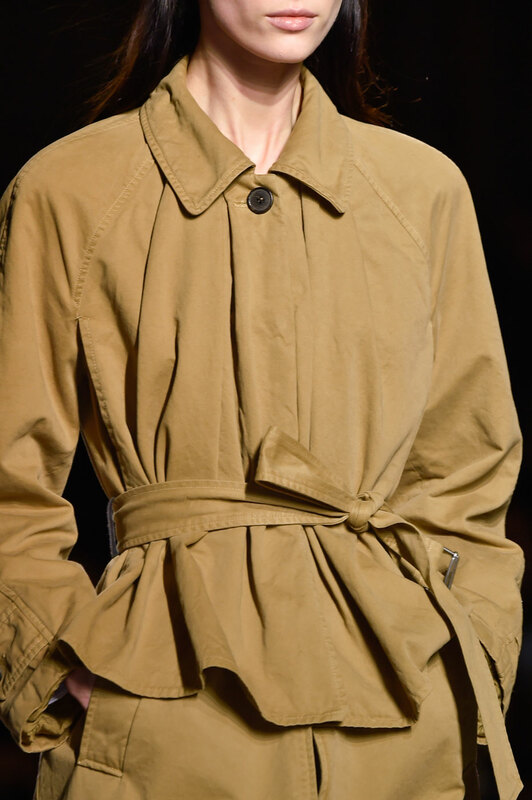 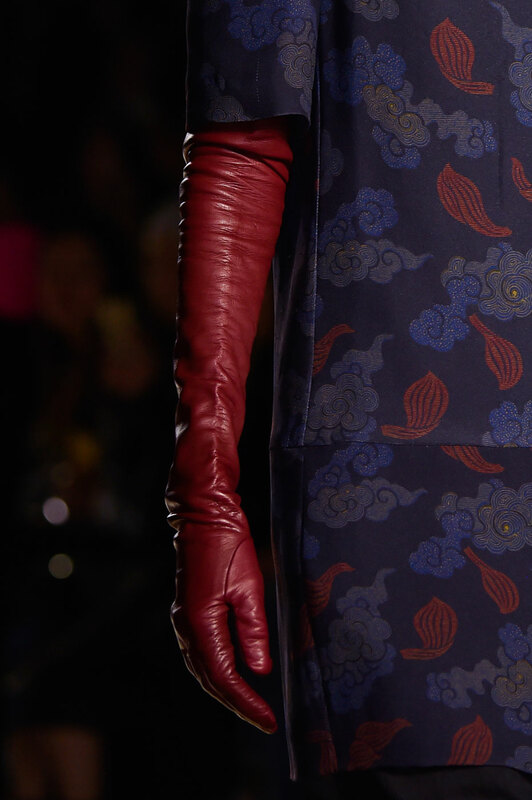 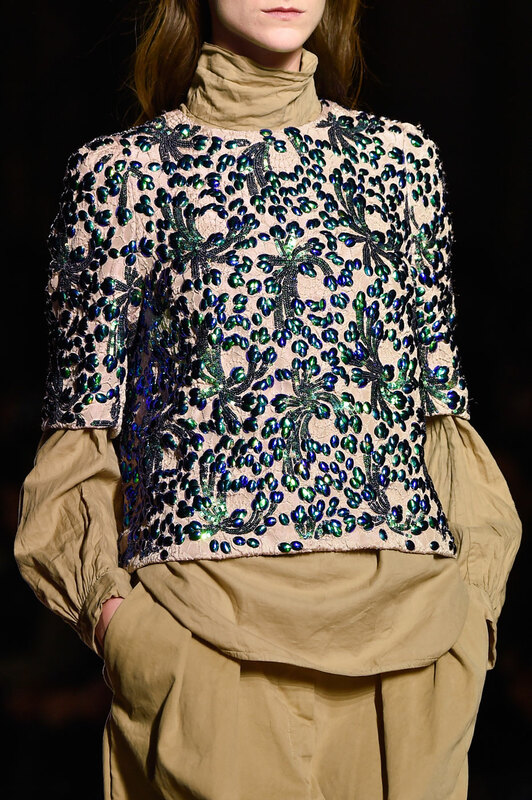 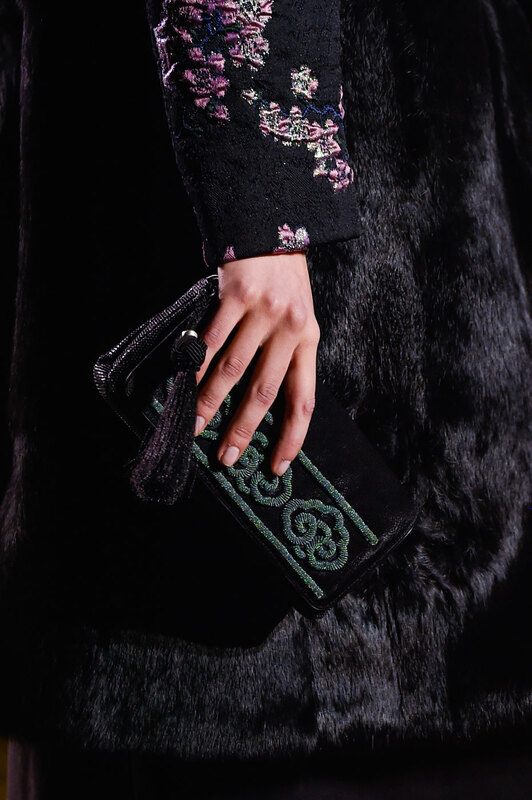 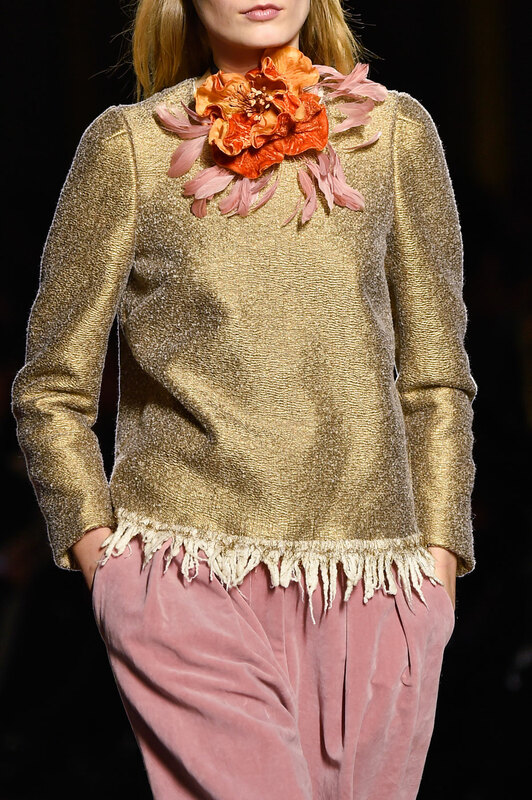 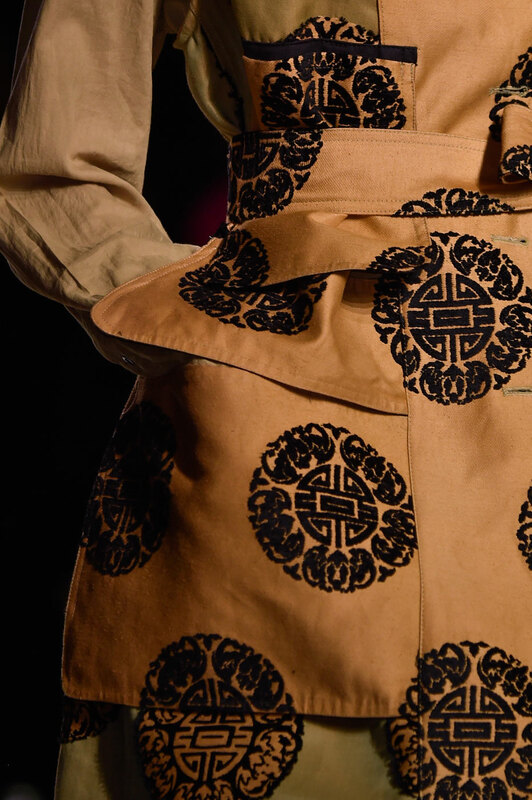 Layering was shown to be a key element and was revealed in a new way; with open skirts tied over jumps suits and turtle necks under embellished tops. 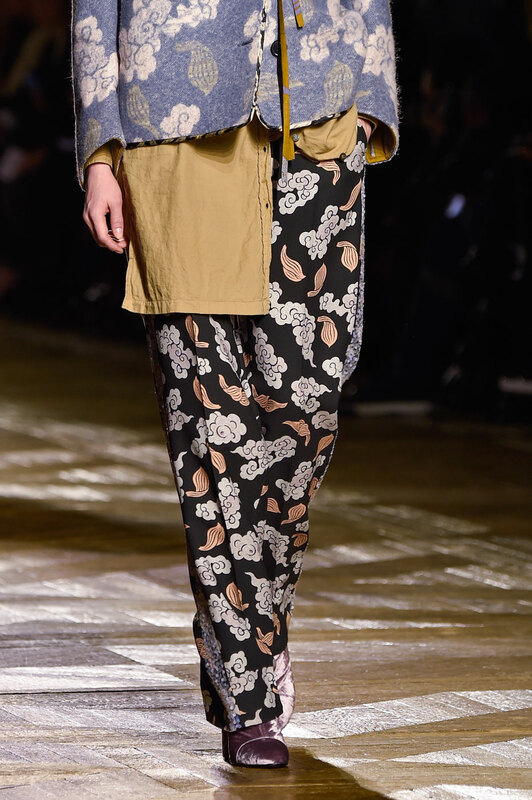 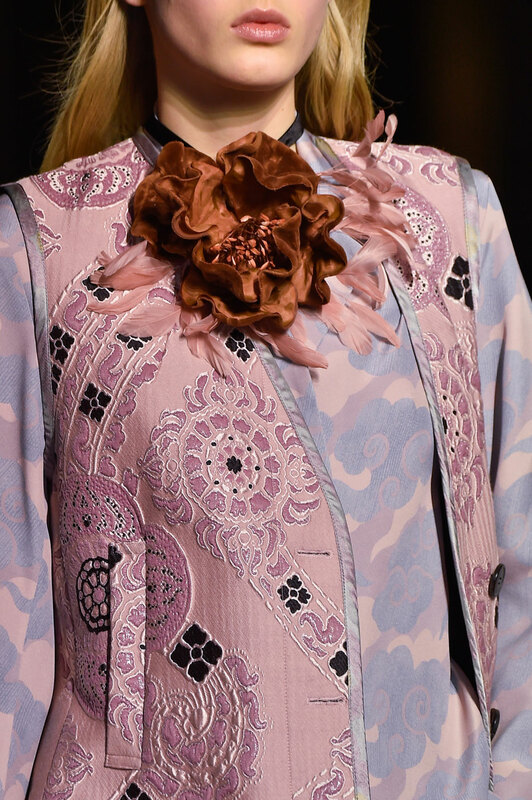 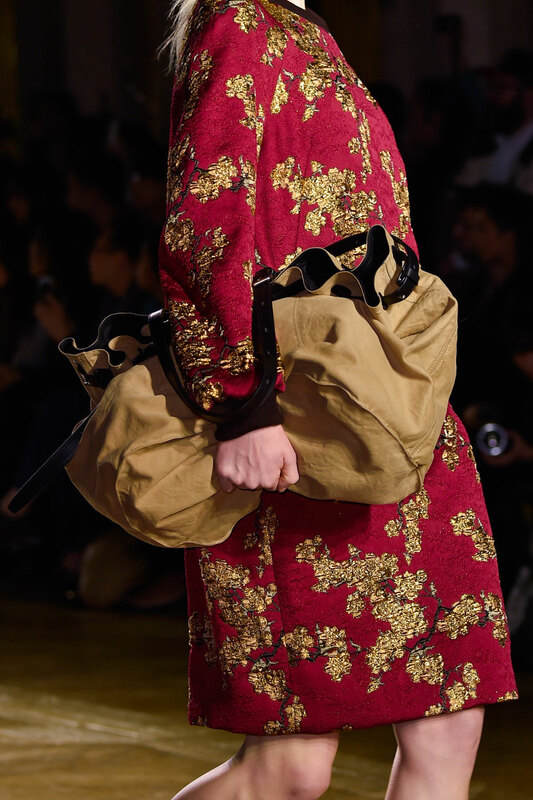 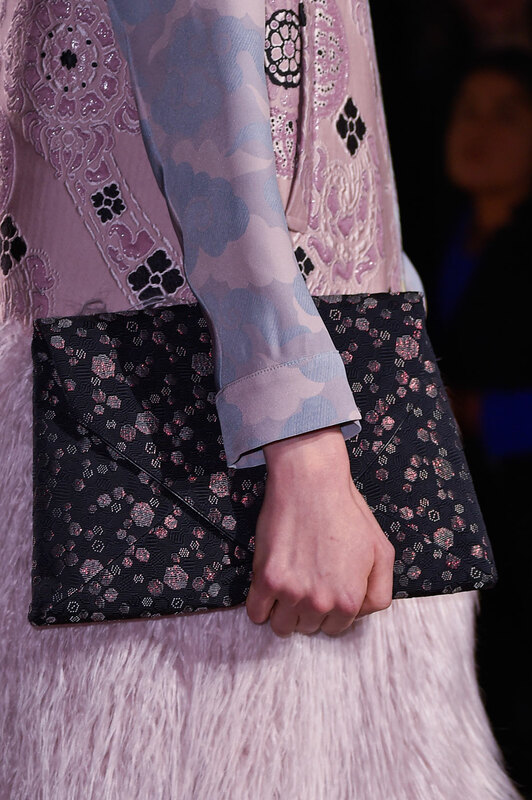 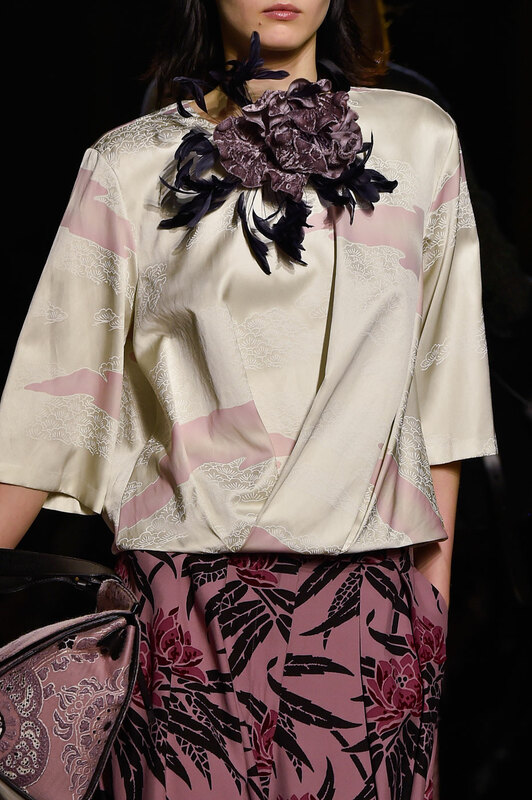 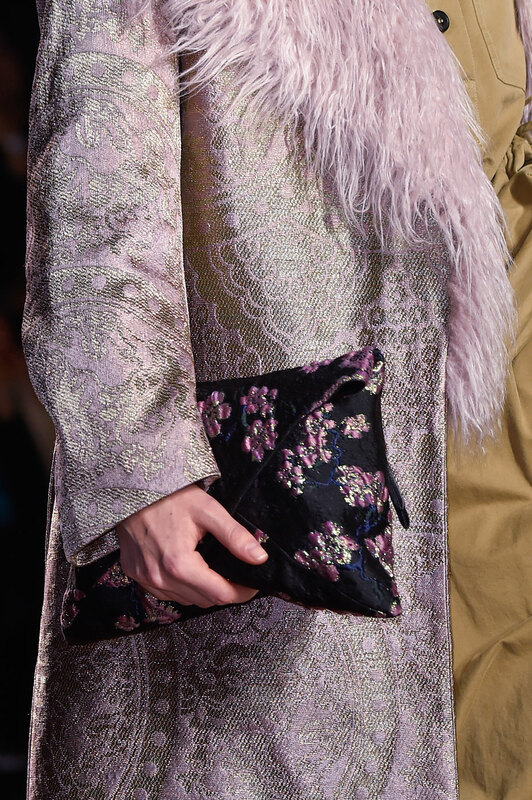 Japanese inspired floral print motifs ran throughout the show in a revamped autumnal colour palette of golden yellow, lilac, khaki, navy, dusky grey and a muted shade of blue. 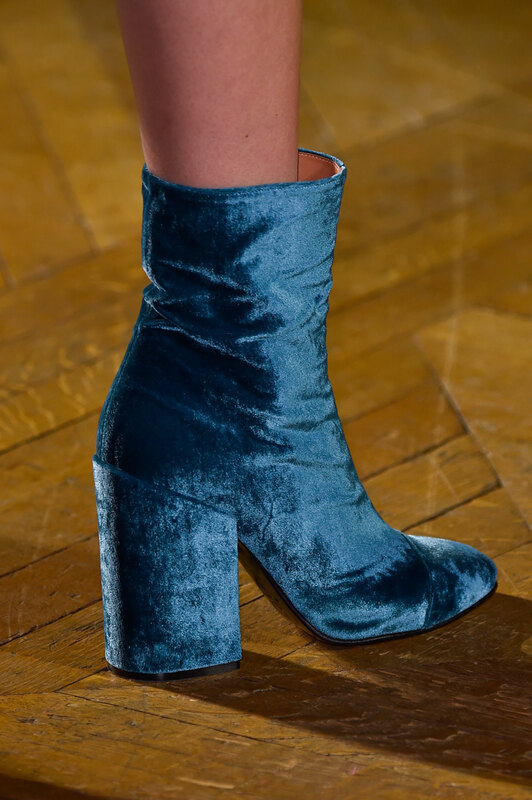 There were floor-sweeping silhouettes and masses of material which included raw silk and luxe velvet which created super slouchy shapes looking comfy and classy. 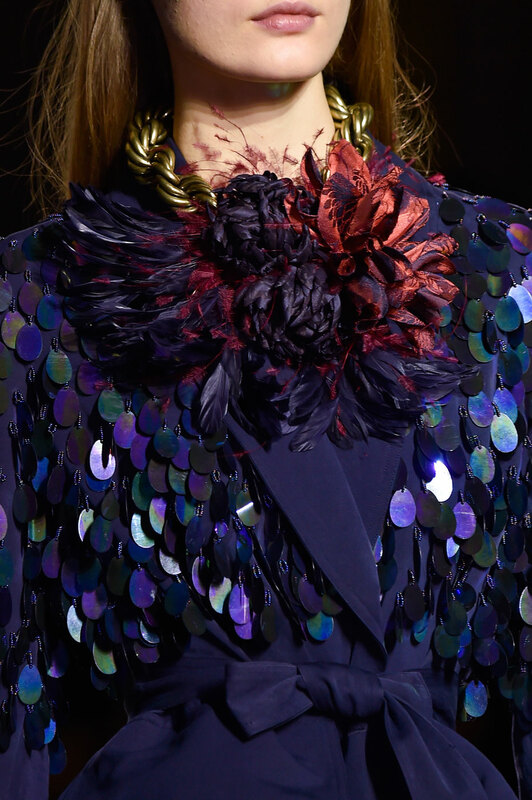 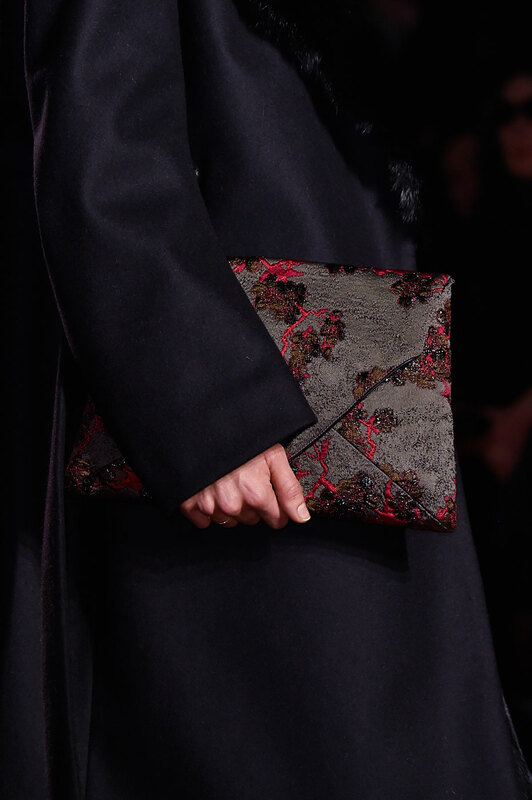 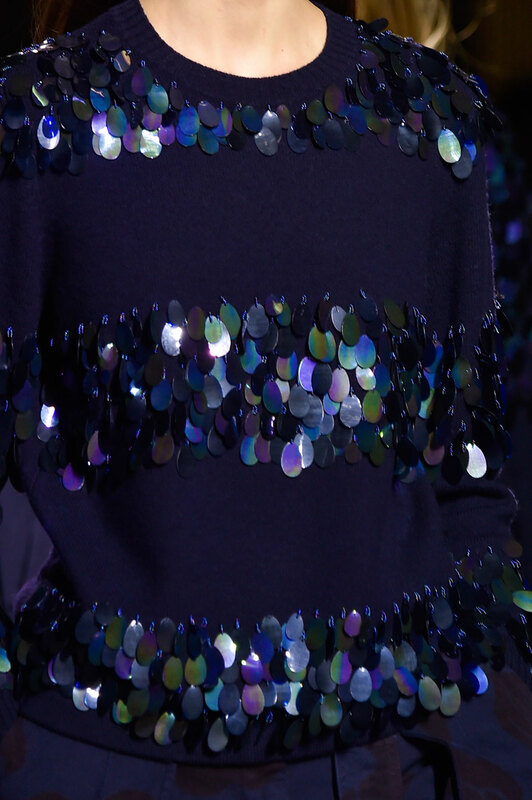 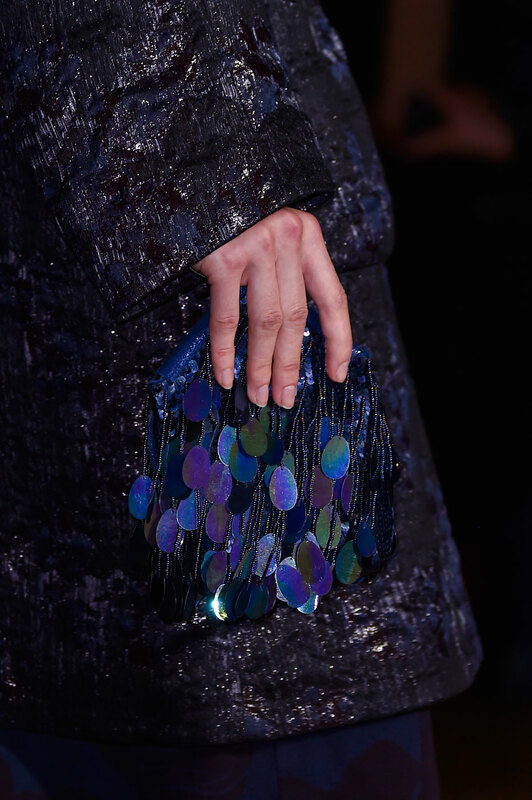 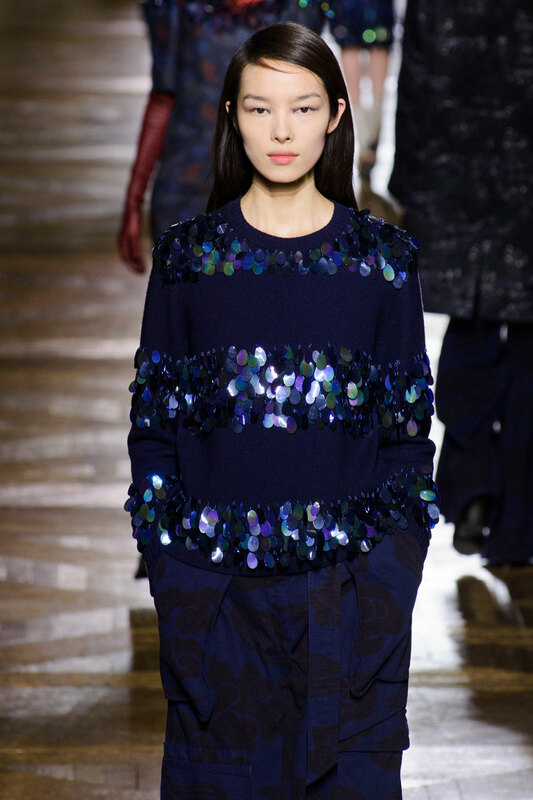 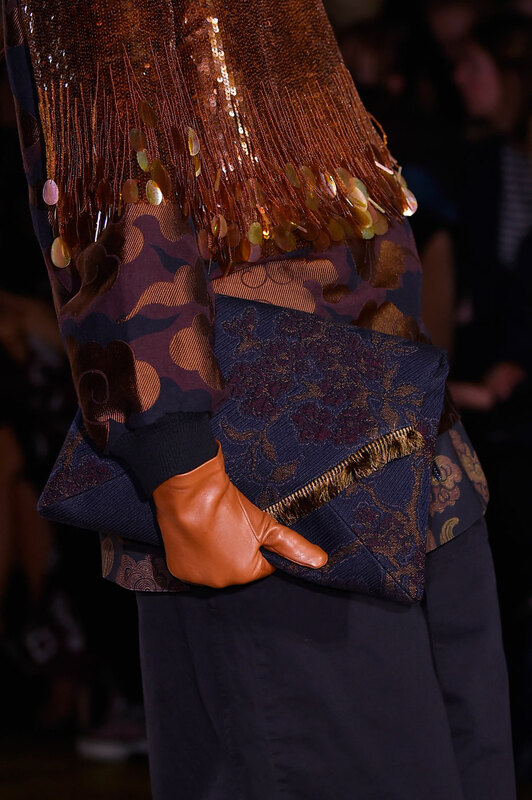 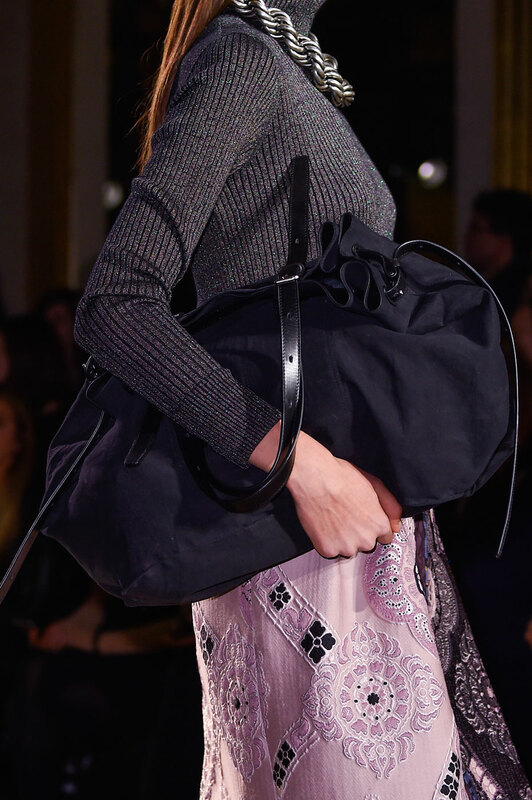 Oversized sequins dangled off mini bags and were vertically placed across tops. 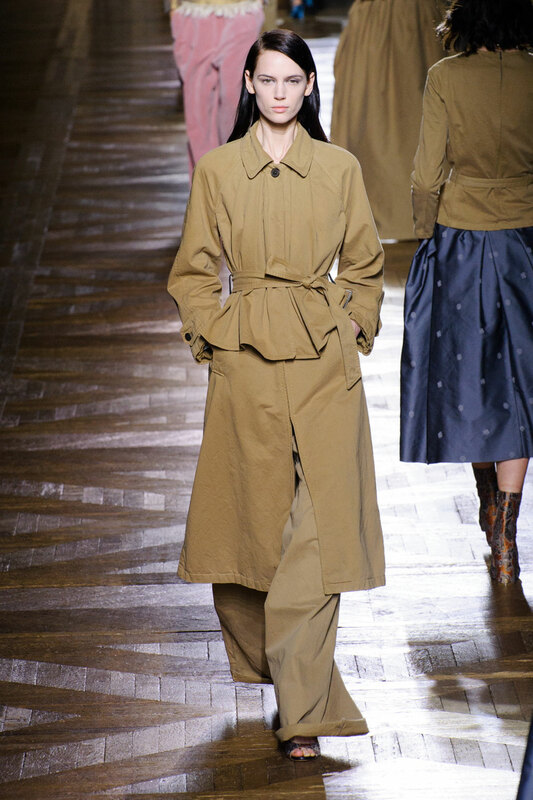 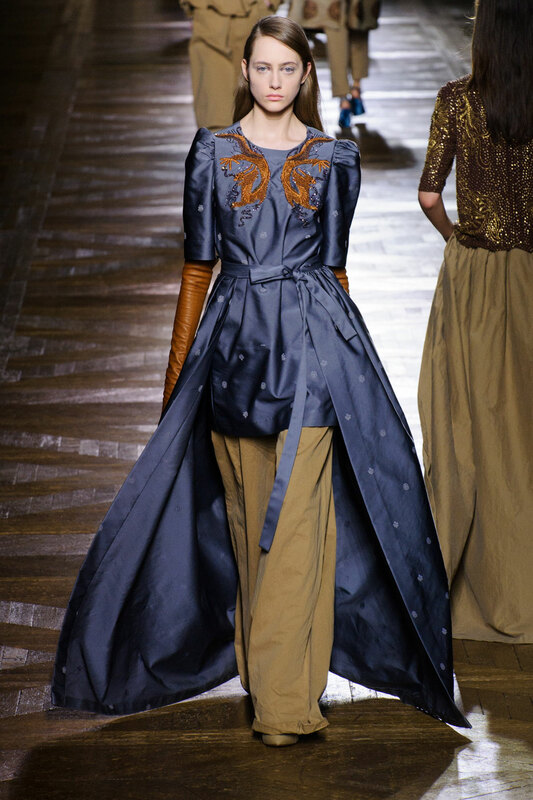 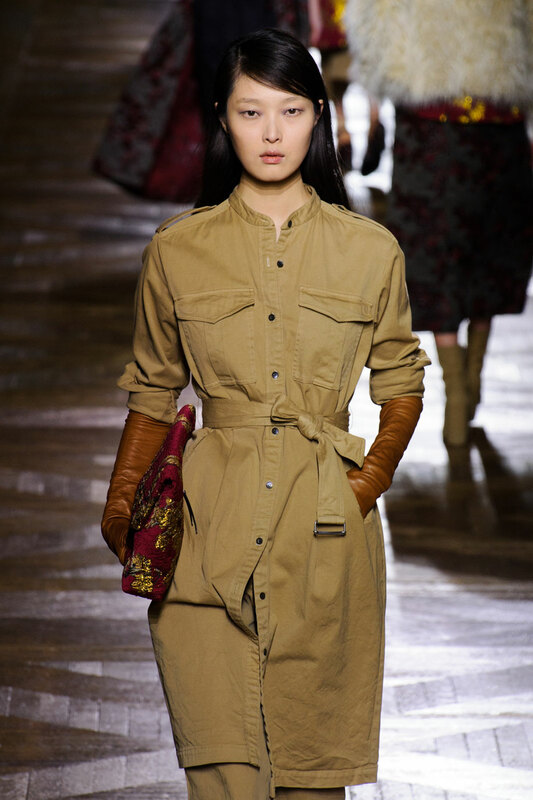 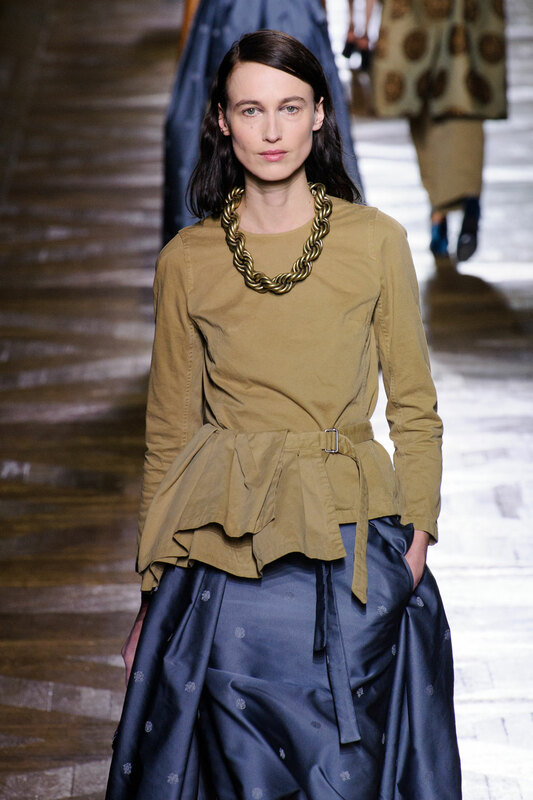 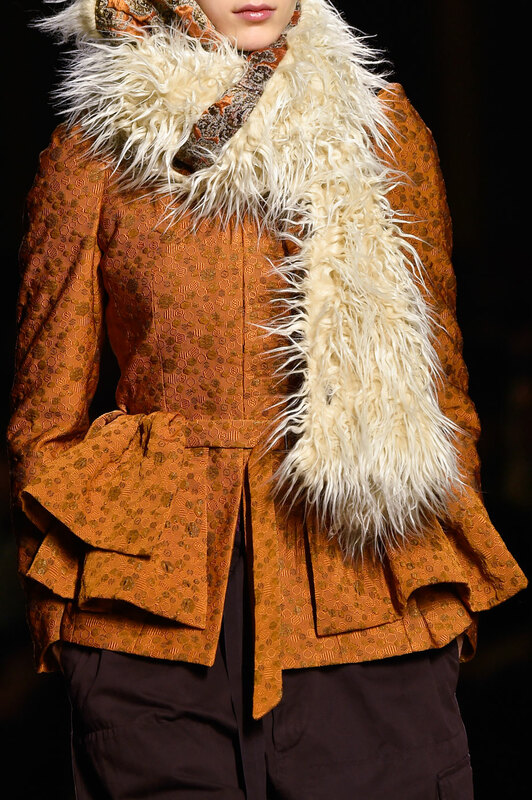 Fitted jackets with asymmetrical peplums hung over one hip and cinched the model’s waist were feminine as well as chic. 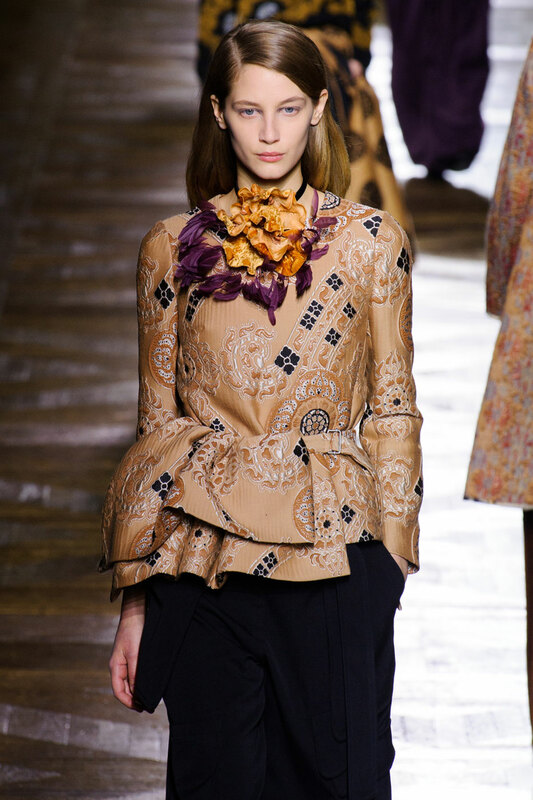 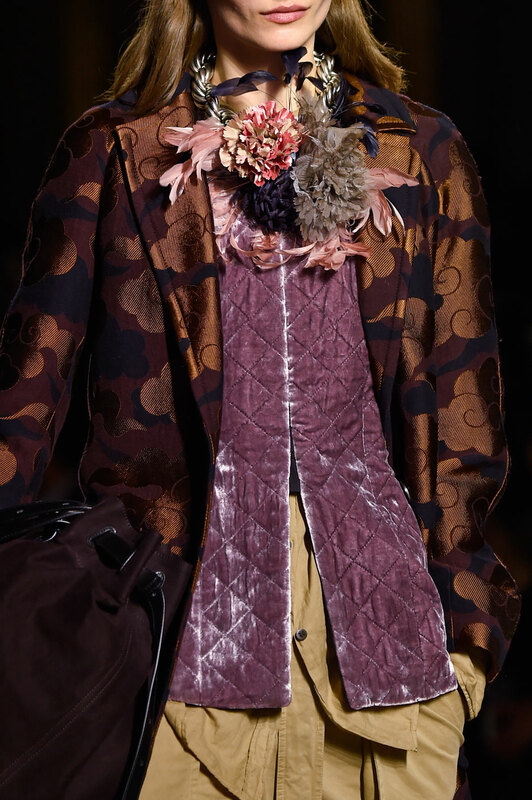 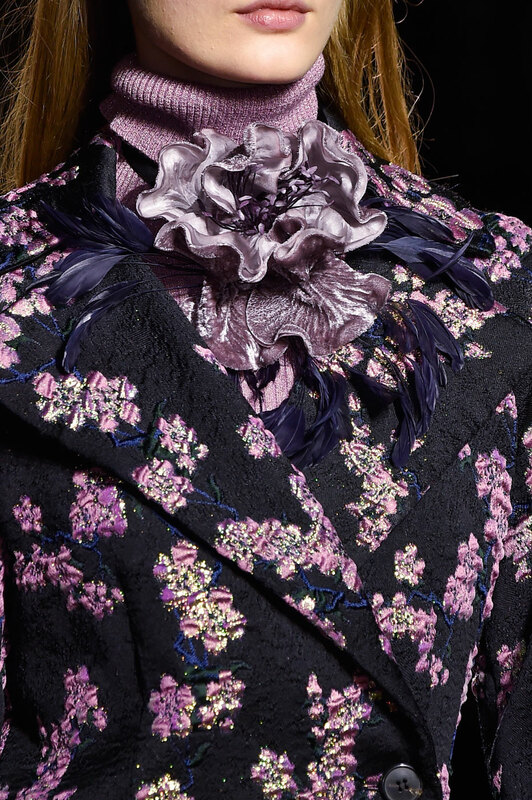 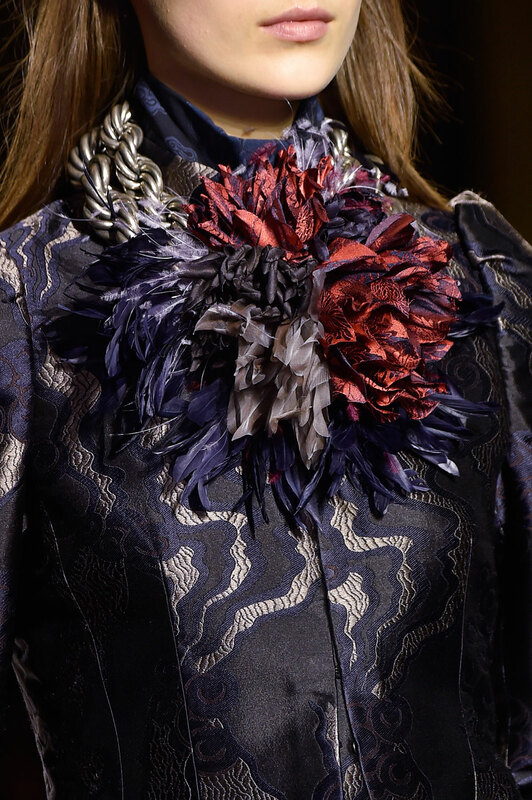 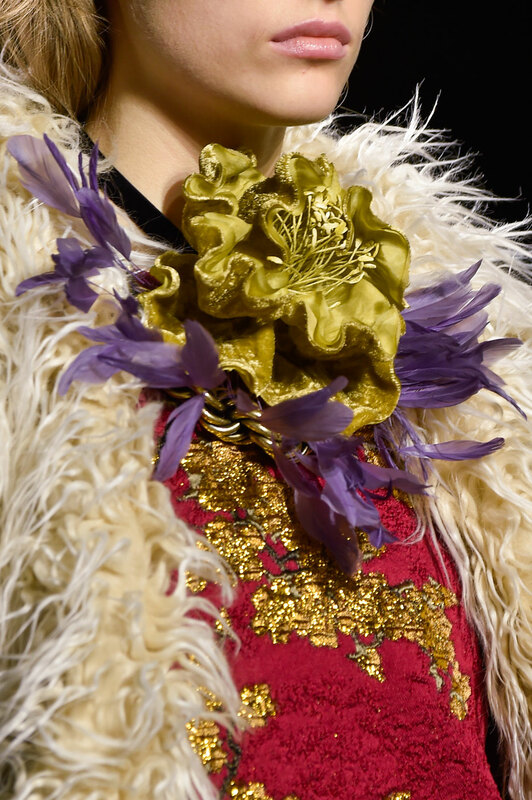 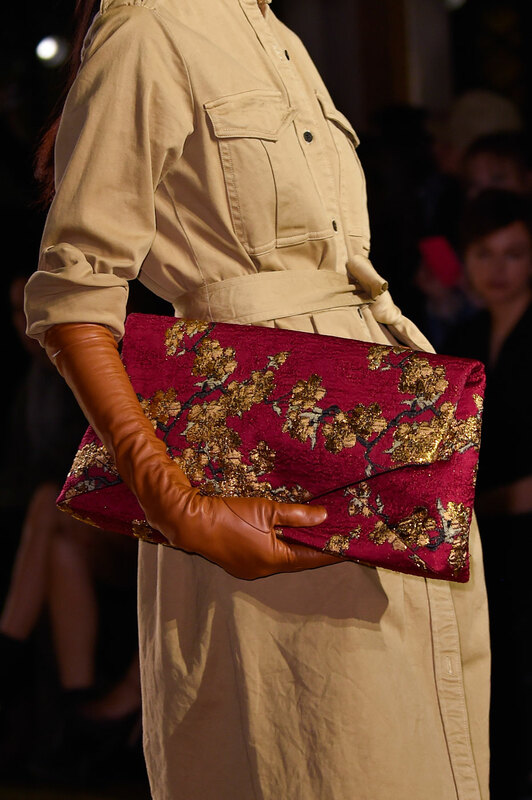 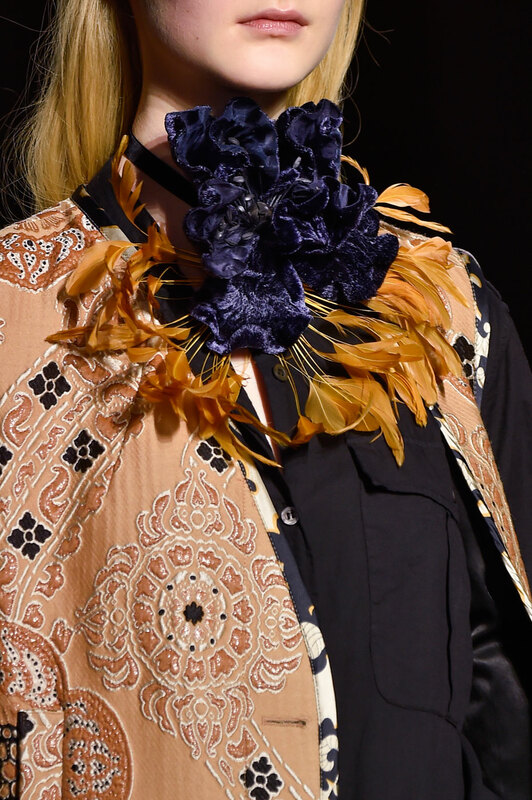 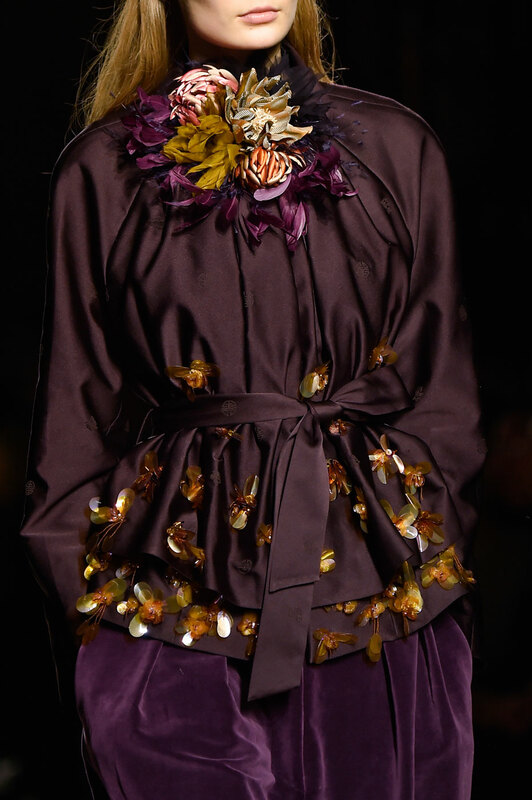 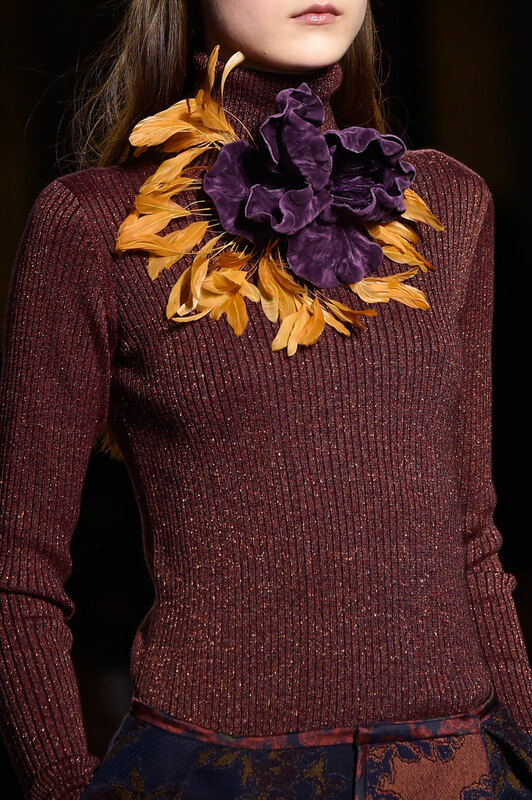 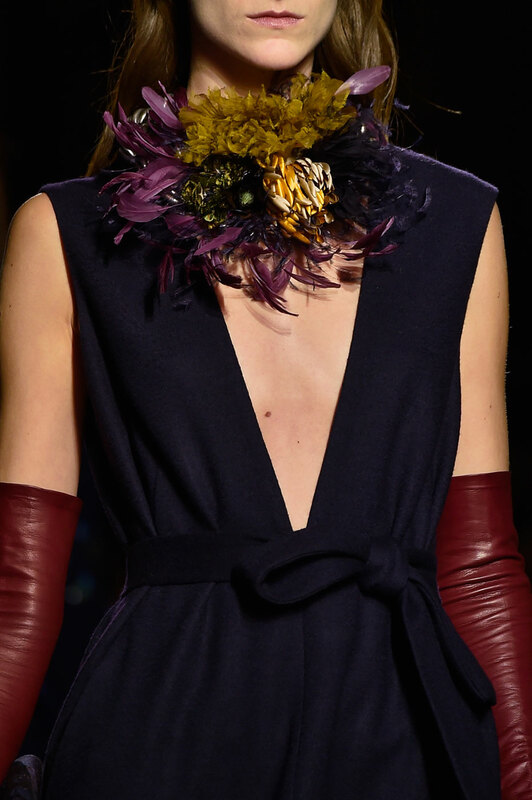 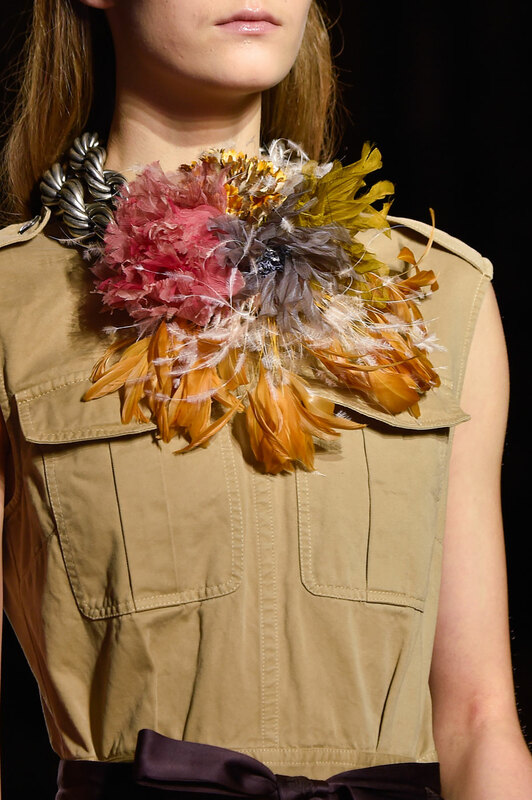 Large autumnal coloured corsages and magnolia fur stoles wrapped necks, replacing the autumnal staple of the scarf and tying the whole looks together and completing the floral theme. 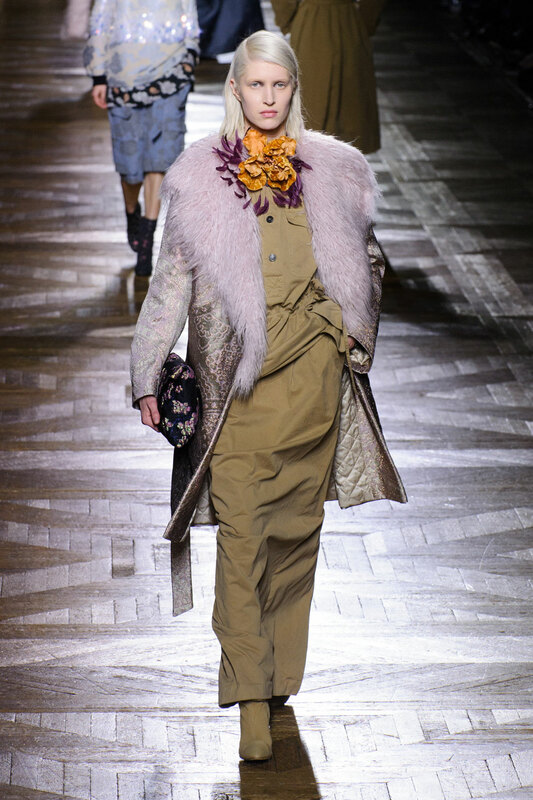 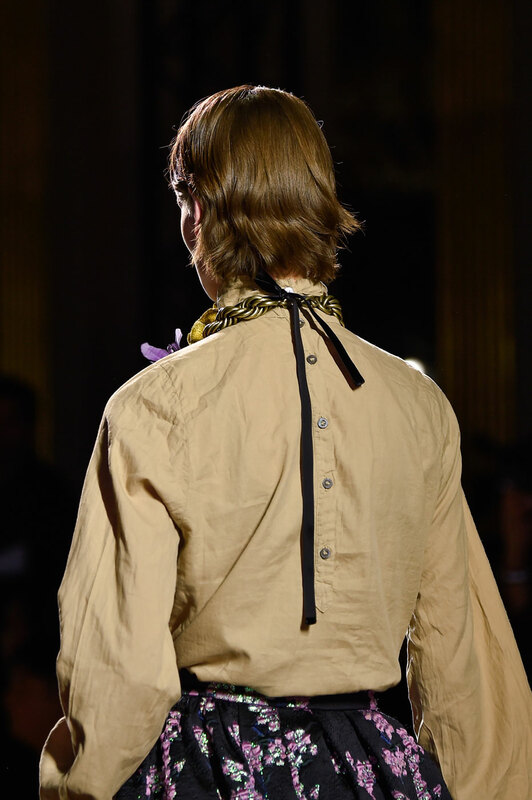 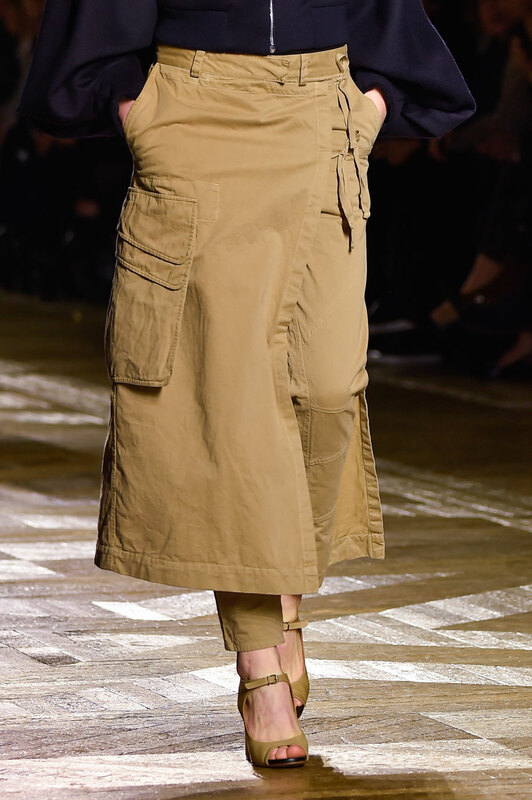 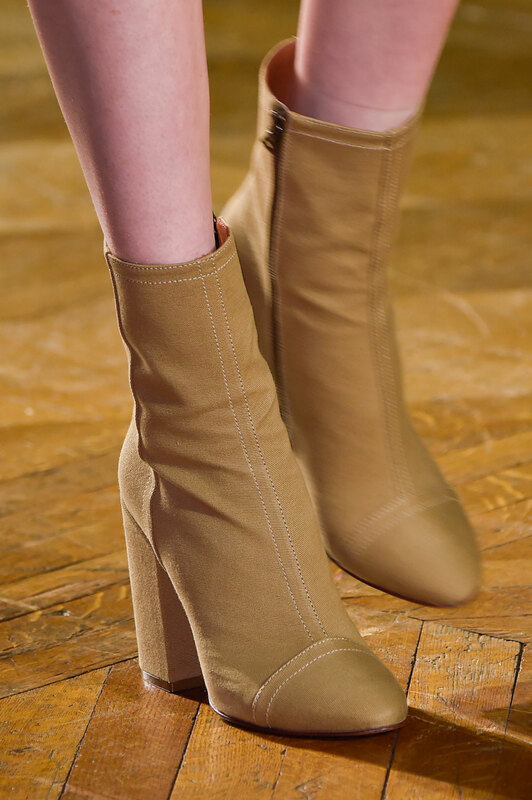 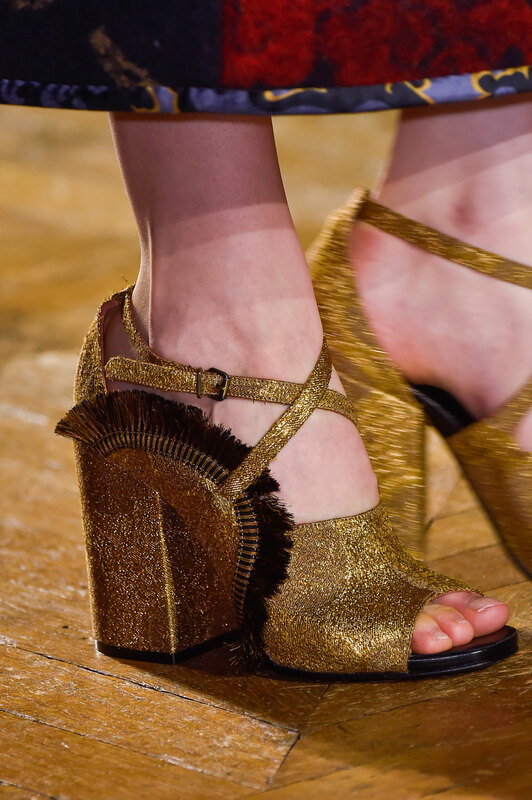 Models strutted down the catwalk in the luxe gilded venue that is Hotel de Ville, in autumnal coloured boots and strappy sandals sporting minimal make up and sleek side parted hair worn behind the ears. 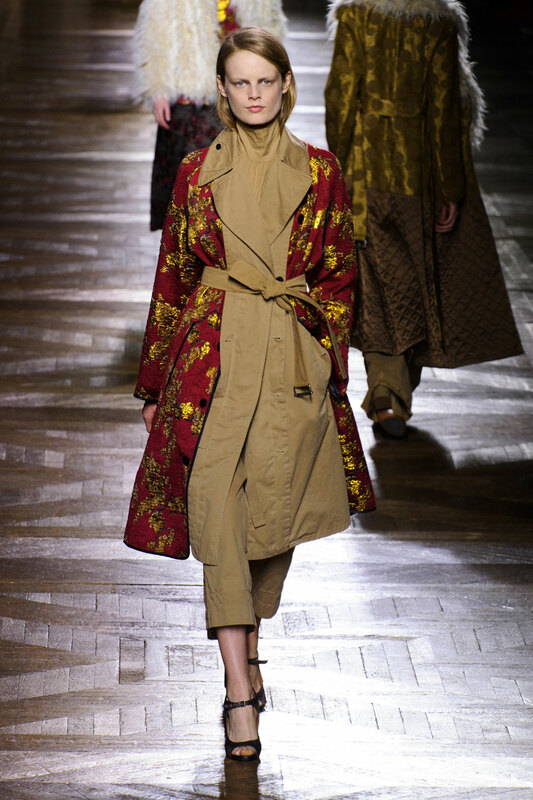 Dries Van Noten, like the a Capella soundtrack of Beyoncé and Debby Harry being played, stressed the power of voices and individuality.